Tempus+MAHATMA project is a three-year grant funded project which was presented during Tempus IV Call for Proposals 5. The project was launched on the 15th of October 2012 and ended on the 14th of October 2015. 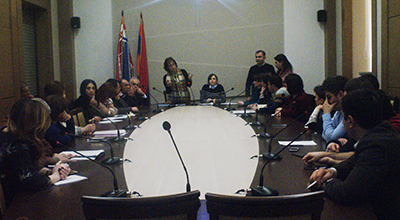 Armenian State Pedagogical University after Kh. 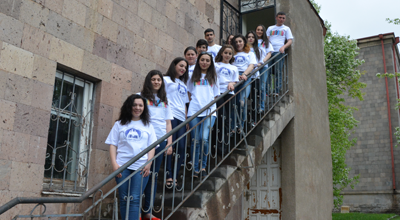 Abovyan, coordinated all the activities within the project: this fact is unprecedented in the history of Armenian universities. 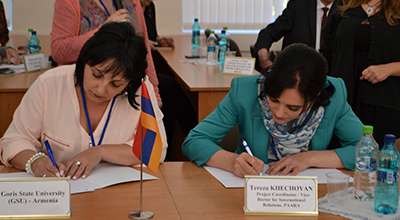 The project aimed to promote the transformation of higher education management in Armenia and Georgia through introduction of a new Master’s Academic Programme/professional development courses in higher education management in compliance with the European standards and principles. 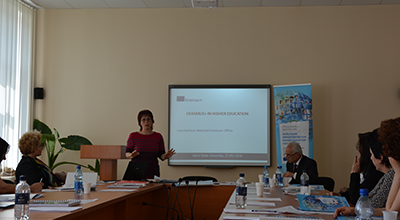 During the project implementation modules for trainings of educational leaders were developed and several cognitive visits were paid to European universities. 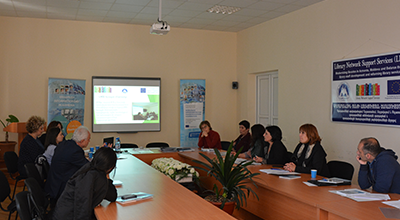 As a result, the representatives of the academic and administrative staff of the project partner universities were trained at the EU universities and other international organizations. Necessary educational requirements, outcomes, an assessment system in compliance with qualifications, a new teaching and learning methodology were developed. 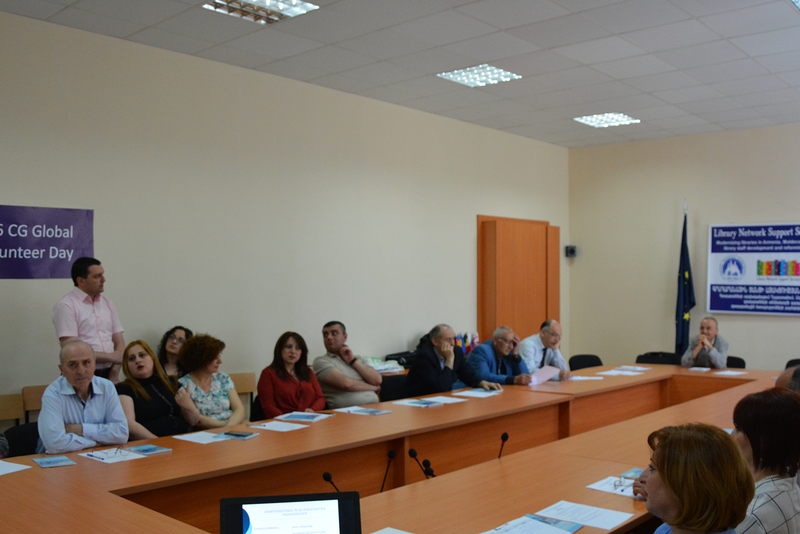 The capacities and skills of the academic and administrative staffs of the partner universities were improved. 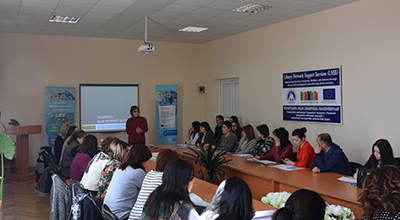 The project also aimed at the introduction and implementation of a new Master Academic Programme in “Education Management”, the professional orientation, involvement of new students in the programme, an introductory consultation for students, students’ exchange programs, as well as the expansion of student‘ s employability. 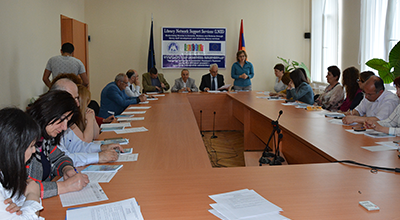 In the framework of the project eight Master Academic Programs were developed and launched at the partner educational institutions in Armenia and Georgia with the support of six European partner organizations. 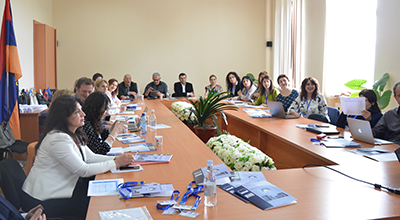 The programme aims to improve the management of Armenian higher education institutions, thus ensuring the effective organization of the educational process, by proposing objectives to meet the current educational as well as the qualitative and professional needs and requirements of the labor market. 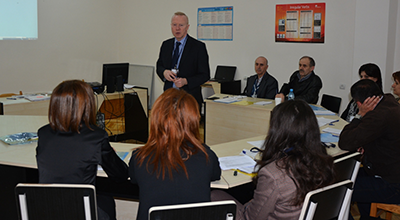 The programme is considered to be a professional challenge for the governing bodies of the educational institutions and other employees who occupy managerial posts in the wider sectors of education. to be fast and timely oriented and react to the modern requirements of education as well as the decision making process. 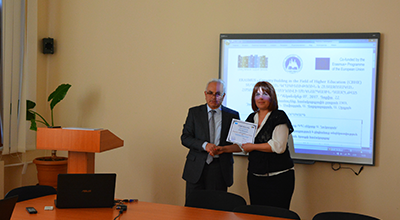 The license-awarded by the Ministry of Education and Science of the Republic of Armenia. The graduates of the academic programme acquire knowledge and skills in the field of management, administration and pedagogy, which provides the opportunity of getting managerial positions in higher education, secondary vocational and general education institutions as well as other areas of professional activities. Education-related state, local authority and community bodies. The Master Academic Programme “Education Management ” provides opportunities for the graduates to continue their studies in postgraduate professional programmes. 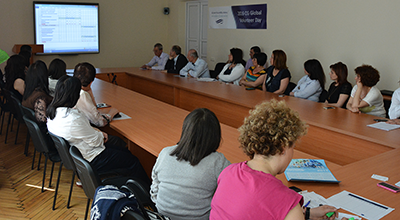 Lana Karlova, Programme Coordinator, Edith Soghomonyan and AniTorosyan, Programme Officers from NationlErasmus+Office in Armenia and A. Papoyan, Deputy Head of Development Programs and Monitoring Department, RA Ministry of Education and Science, as well as S. Karabekyan, Education Expert were at GSU on June 7-8. 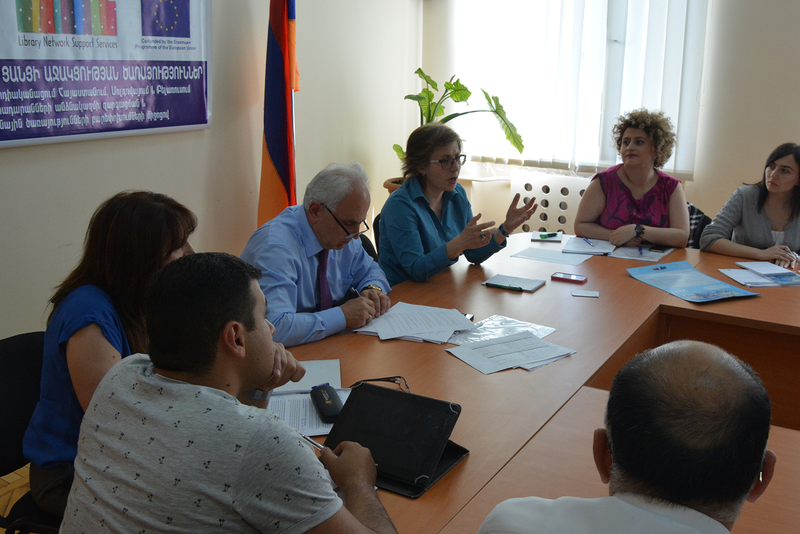 The monitoring of Tempus+MAHATMAamd ARARAT projects which was carried out by Lana Karlova, Programme Coordinator, Edith Soghomonyan and AniTorosyan, Programme Officers from NationlErasmus+Office in Armenia, took place on June 7. 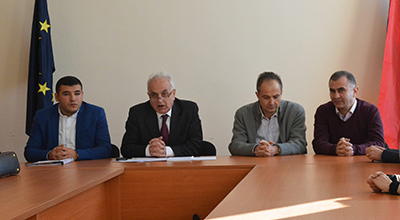 The rector of GSU A. Ghukasyan, the staff of the Center for International Cooperation and Projects, the members of MAHATMA and ARARAT working groups as well as the representatives of the academic and administrative staff from GSU were present at the monitoring meeting. 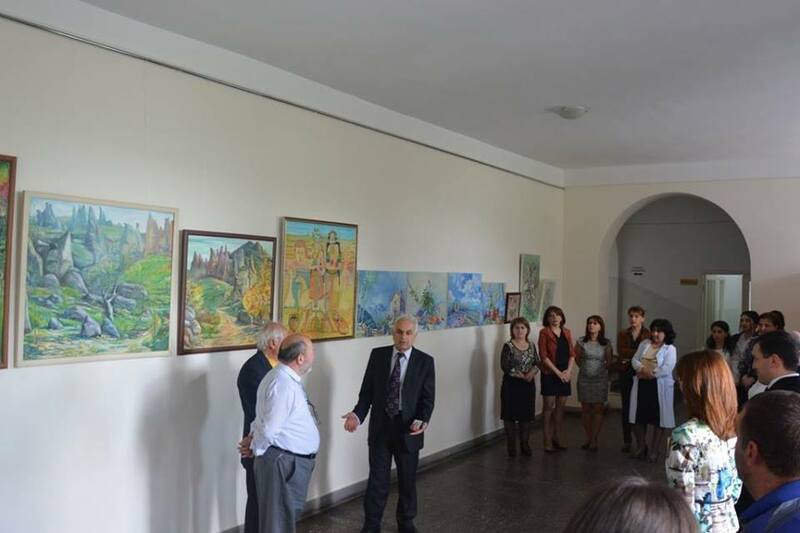 The rector of GSU A. Ghukasyan welcomed the participants of the event and represented the tangible results, sustainability and possibilities of further cooperation in the frames of MAHATMA and ARARAT projects which had been implemented since 2012 at GSU. He particularly mentioned that the main outcome of MAHATMA had been the introduction and sustainable implementation of Master Academic Program of Education Management at GSU. Most of the graduates with this specialty work in the respective professional field. The curriculum and the academic programs had regularly been overviewed and updated. 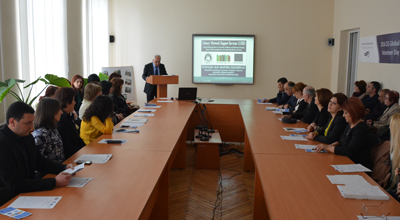 The rector also emphasized that the main guarantee to ensure the sustainability of the project was the cooperation between the partner universities of the project and the International Association for Educationalists would highly contribute to it. 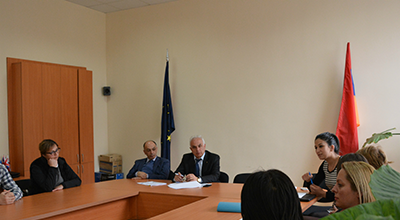 As for the implementation of ARARAT project the rector spoke about it by mentioning that the tangible outcome of the project could be considered the capacities and skills of the academic and administrative staff gained in the result of trainings, University-Enterprise cooperation and the collection and creation of the data about the graduates. Even though the project is over the data are continually updated and the frames of cooperation are being expanded. 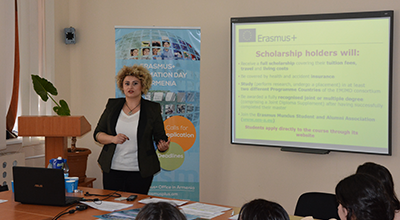 The Programme Coordinator of the National Erasmus+OfficeL.Karlova welcomed the participants and spoke about the projects by stressing the development and reforms in the educational institutions and systems, the creation of academic programs, the improvement of the management of HEIs as well as the effectiveness of the work implemented to ensure the consolidation of the links between the society and Higher Education in the frameworks of the implementation of the projects. She also referred to the students’ mobility at GSU and met some students who had taken part in the mobility as well as some graduates of Education Management. 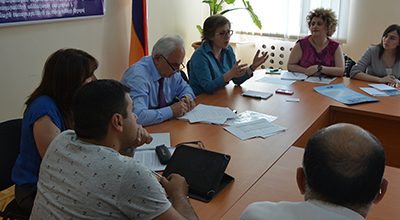 The guests also had discussion about the mutual visits, trainings, exchange of best practices and registered outcomes in the frameworks of the projects with the members of the working groups of MAHATMA and ARARAT from GSU. 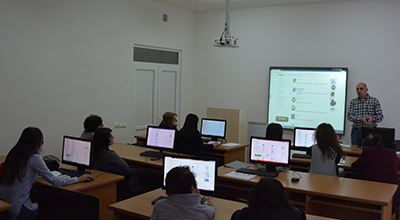 At the end of the first working day the guests visited the classrooms equipped with necessary information technologies in the result of the project to see and make sure to what extent the equipment purchased in the frame of the projects contribute to the education process and the sustainability of the projects. 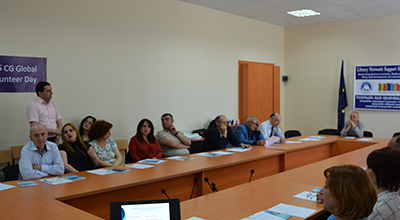 On June 8, the experts of Higher Education Reforms held a seminar-meetingconcerning the creation and management of strategic plans for the regional HEIs of RA. 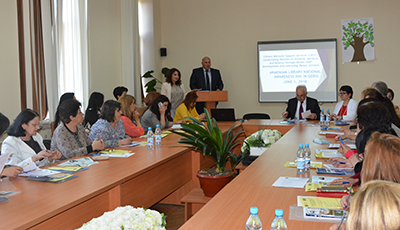 The seminar was led by A. Papoyan, Deputy Head of Development Programs and Monitoring Department, RA Ministry of Education and Science, as well as S. Karabekyan, Education Expert who referred to the challenges connected with the HEIs, the consonant strategic steps, the purposefulness of internal self-analysis as well as the proper planning and design of the strategic plan for GSU.The discussions revealed the strengths and weaknesses of GSU, the main issues and the important strategic steps that should be taken in order to motivate the students’ mobility, the professional recruitment of the academic staff, the cooperation between the HEIs, the proper application of the resources, the implementation of professions meeting the requirements of the market, the inflow of the entrants and the progressive development of the university. 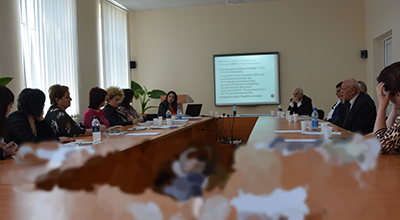 By summarizing the seminar the experts expressed their gratitude for the cooperation and willingness to meet again to discuss the new regulations for the development of GSU which would make true the vision of the university. 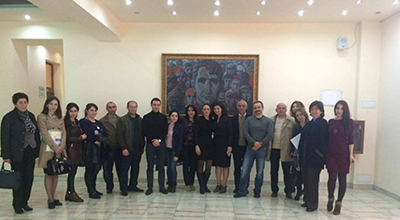 TEMPUS MAHATMA Project Final Conference was held at the Armenian State Pedagogical University after KhachaturAbovyan on the 30th of September, 2016. 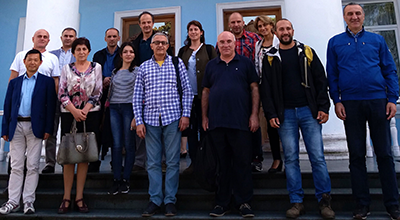 Consortium partners from Georgia, UK, Italy, Germany, France and Czech Republic met again to present the achievements, tangible outcomes,good practice used in the project and further plans within the project’s 4-year implementation. 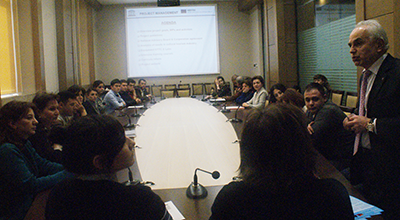 MAHATMA is a multi-country joint projectwhich aims at promoting reforms of higher education in Armenia and Georgia. 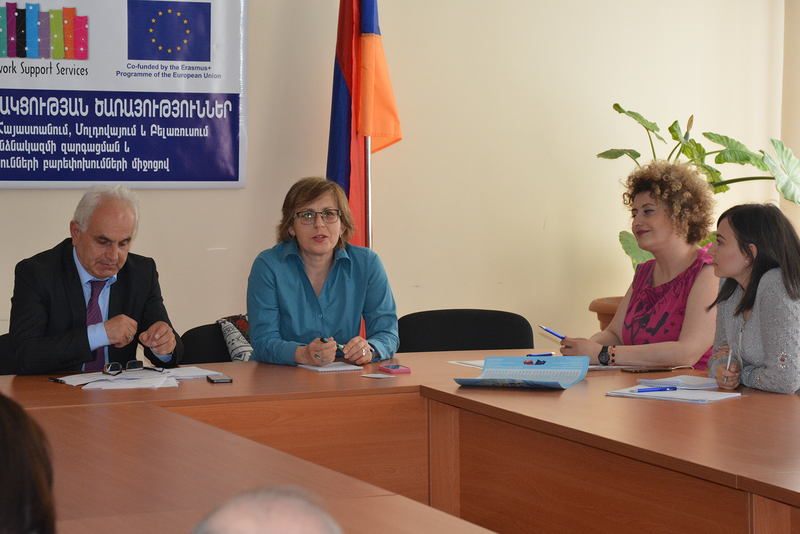 8 Master Programs were developed at partner institutions of Armenia and Georgia with the support of 6 European institutions and organizations. 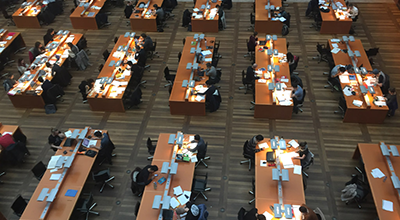 Master programs introduce new teaching and learning methods, student assessment approaches. 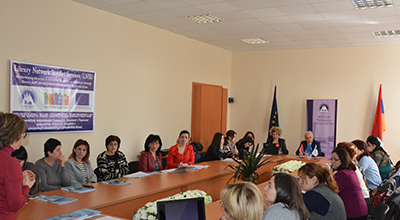 Capacity building was conducted among academic and administrative staff, student mobility to European Partner HEIs as well as exchange of students were organized in the frameworks of the project. 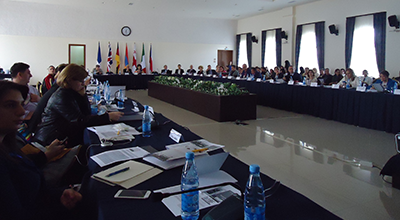 The International Association for Educationwhich was established to promote the effective cooperation between the stakeholders, was also presented during the conference. 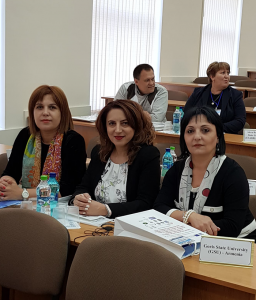 Representatives from GSU,which is a partner of the project, were also participating in the conference: H. Petrosyan/Head of the Chair of Psychology and Pedagogics/, N. Safaryan/ Project trainer/, S. Hairapetyan/Person in charge for ICQA/, T. Ohanyan/Assistant at ICQA/, as well as the students of Education Management Master course A. Minasyan and A. Mkrtchyan. 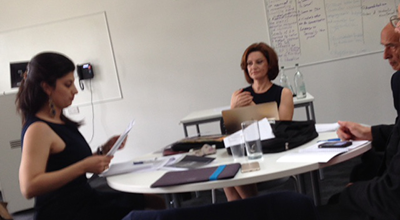 A FINAL Governing Board andIntAE GB MEETING within the frameworks of TEMPUS Mahatma project took place at Bath SPA University,UK, on 03-06 July,2016.Mahatma and IntAE GB members participated in the event. 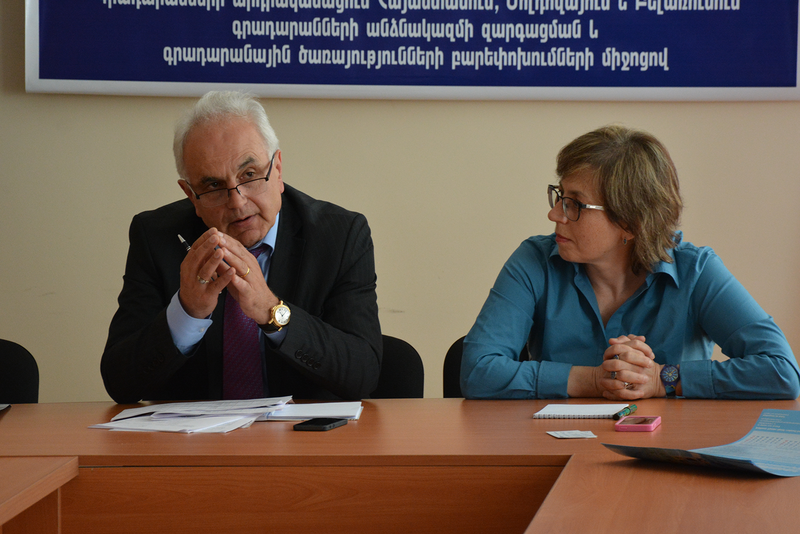 Rector A. Ghukasyan, and Project trainer N. Safaryan were representatives from GSU at the meeting. 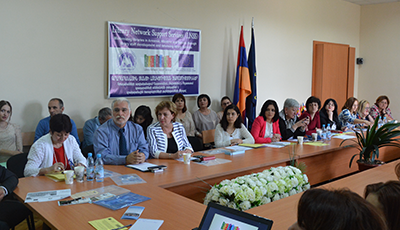 The aim of the event was: – to sum up the activities conducted and left within MAHATMA project before the final conference in Yerevan – to discuss the developments of the publications and set the final dates – to discuss the financial and technical issues within the project – to agree on the agenda and logistics for the final conference in Yerevan – to discuss the IntAE upcoming activities, Journal developments during the II GB meeting: Each of the lead partners was asked to prepare a brief presentation on the current status of the WP and focus on the activities to be conducted by the closure of the project if the WP was not completed. 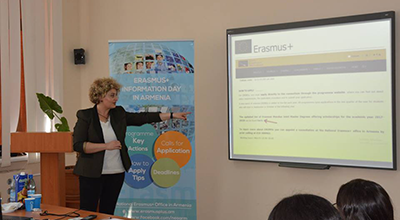 On May 26-27, 2016 National Erasmus+ Office in Armenia (NEO-AM) staff Lana Karlova and Edith Soghomonyan had a monitoring visit and anErasmus+ Information Session atGoris State University. 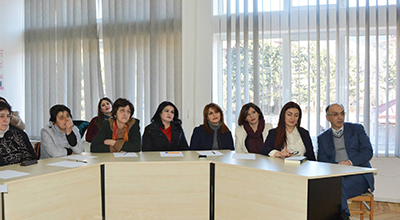 GSU management, the representatives of the academic and administrative staff as well as representatives of non-governmental organizations and employers from Syunik region were present at both the events. 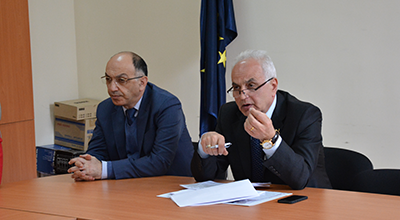 The purpose of the monitoring visit was to discuss the current state, development and sustainability of the past 3 Tempus (ARARAT, Cap4Com and MAHATMA) and 2 new ongoing Erasmus+ (LNSS and HERITAG) projects in which Goris State University is a partner institution. 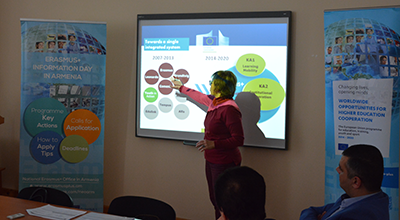 The meeting was also an occasion to present the results achieved within the years of the project cooperation. 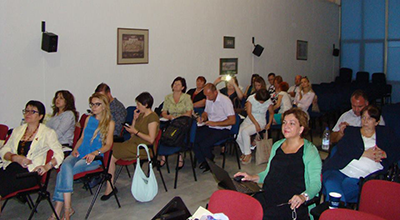 On the following day, May 27, Erasmus+ Information Session was organised in order to inform the local beneficiaries about the Erasmus+ Programme, in particular about the Erasmus+ Call for Proposals to be launched in October 2016 and on several actions relevant to the international dimension of Higher Education: Capacity Building in Higher Education (CBHE), International Credit Mobility and Jean Monnet Activities. 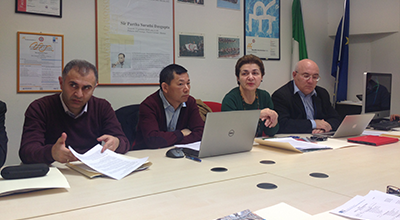 The first IntAE (International Association for Education) meeting was held to gather the Governing Board members of the Association to agree upon the IntAE core documents and finalize the activities related to its and International Journal operationalization. The event is scheduled at IBSU, Tbilisi, Georgia on 3rd of May 2016. 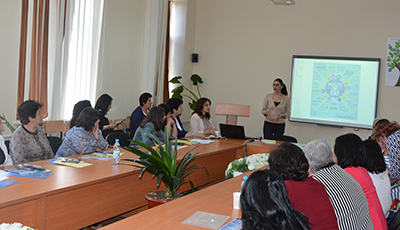 On the following day, May 4, a dissemination conference took place at the same university whichenabled the project partners and stakeholders to have an overview of the project achievements and its impact on the partner activities. 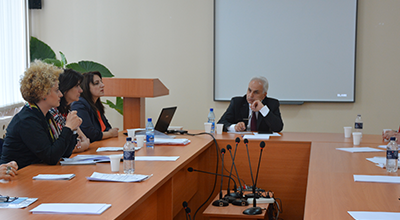 Vice-rector at GSU Z. Grigoryan and Project trainer N. Safaryan were participating in both the events. 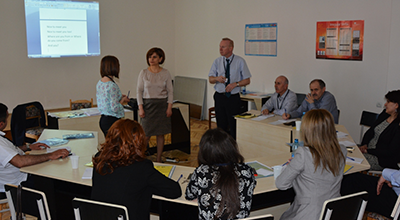 A Capacity Building Event(CBE)within MAHATMA project was conducted in GEORGIA and ARMENIA on March 17-18,2016.The event This is the fourth and the last training organized which will help the faculty members to revise their academic programs along with the recommendations from the QA Agencies and taking into consideration the topics to be delivered by EU partners. 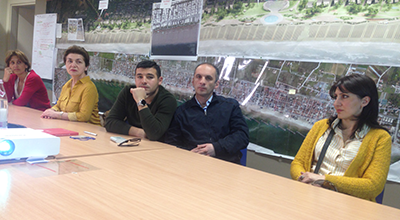 The topics were identified during the last coordination meeting and agreed with the consortium. 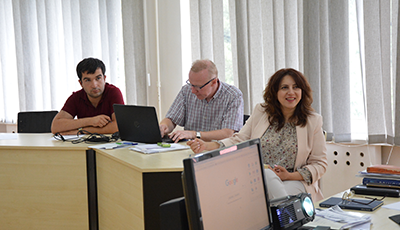 Nine representatives from GSU were participating in the training: Z. Grigoryan/ Vice rector at GSU/, H. Petrosyan/Head of the Chair of Psychology and Pedagogics/, N. Safaryan/ Project trainer/, S. Hairapetyan/Person in charge for ICQA/, T. Ohanyan/Assistant at ICQA/, G. Stepanyan/ Lecturer at the Chair of History/, G. Minasyan/Head of the Chair of Economics/as well as the students H. Babayan/Economics/, and A.Nahapetyan/Education management/. 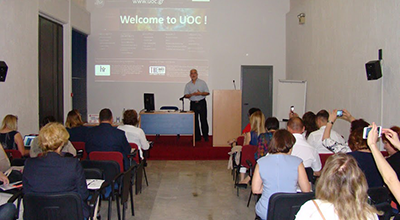 The training were delivered by Milan Pol, MU,George Dafoulas,MDX and covered the following topics: – Monitoring and involvement of students in research process – Information technologies in educational management – How to promote the sustainability of the programme and the international mobility of students and teaching staff after the end of the project – Professional ethics (How to deal with students) etc. 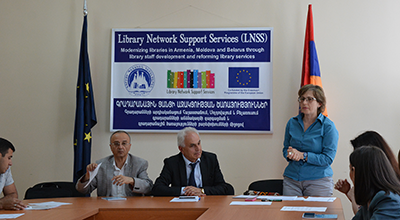 Goris State University is a partner University of the Erasmus+ “Library Network Support Services (LNSS): modernising libraries in Armenia, Moldova and Belarus through library staff development and reforming library services” Project. 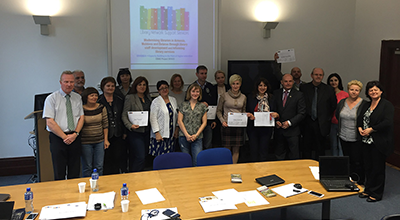 In the frameworks of the Erasmus+ “Library Network Support Services (LNSS): modernising libraries in Armenia, Moldova and Belarus through library staff development and reforming library services” Project a training “English for specific needs” was held for the library, faculty and administrative staff of GSU. 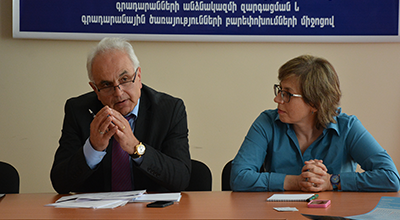 The trainings were conducted by the representatives of the project, EU trainers professor Gerard Cullen and Sabrina Hutter. In order to organize the training more efficiently the trainees were split into two groups according to their level of English: beginners and intermediate to advanced. The beginners’ group first took a test which revealed their level of English. 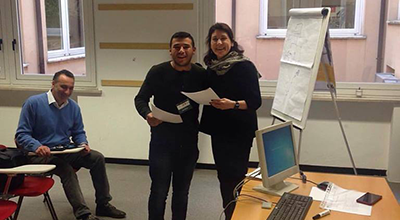 Afterwards the trainer Sabrina Hutter helped the trainees to improve their English through a range of grammatical and vocabulary exercises and tasks by using effective methods of teaching. The trainer of the intermediate-advanced group Gerard Cullen introduced the technique of CV writing, public speaking and presentation making through various presentations. The trainees applied and practiced the gained knowledge and skills by writing their own CVs and creating presentations on various topics and representing them. 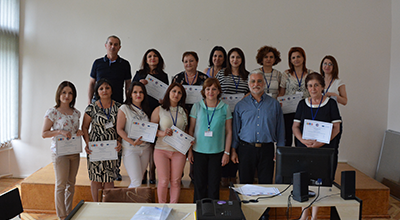 At the end of the two-day training session the participants were awarded certificates. The interactive methods used during the trainings contributed to the formation of information and practical skills among the trainees as well as enriching their professional knowledge. 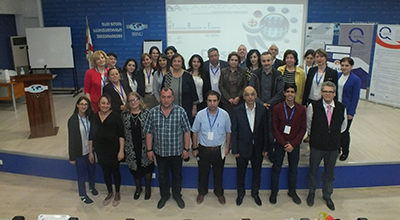 The participants of the training expressed their gratitude and willingness to participate in the upcoming trainings organized in the frameworks of the project. 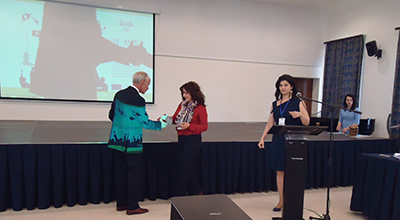 At the end of the training the participants were awarded certificates. 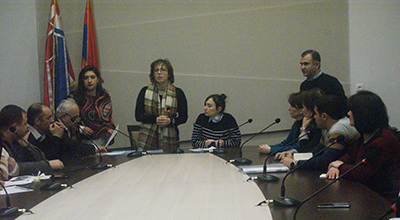 Afterwards the training was summarized by a round table discussion with the rector of GSU. 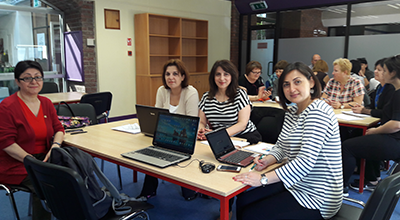 In the frameworks of Erasmus+LNSS project action plan the main trainings for curricula development were held at Limerick Institute of Technology (Ireland) from 22 August to 2 September, 2016, The representatives of the LNSS project consortium members from 9 educational institutions: librarians and professors from Armenia, Belarus and Moldova attended the trainings of the development of eight training modules for librarians. 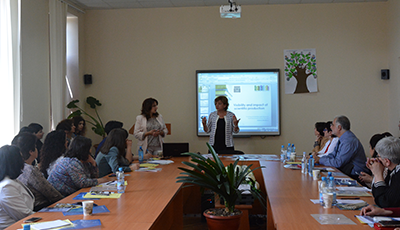 Naira Safaryan (project coordinator) and Alina Ghazaryan (librarian)from GSU participated in the trainings. The training was carried out under the supervision and with the consultation of the EU trainers and library experts Jerald Cavanagh, Padraig Kirby from Limerick Institute of Technology (Ireland), Gerard Cullen from the Pyramid Group (Germany), Angela Repanovici from Transylvania University (Romania) and Manolis Koukourakis from Crete University (Greece). 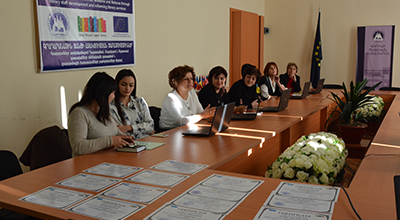 The representatives of the nine consortium member universities designed and presented the strengths and weaknesses (SWOT analysis) of the university libraries of the three countries, as well as developed the drafts of the eight training modules for librarians with the support of the European partners. 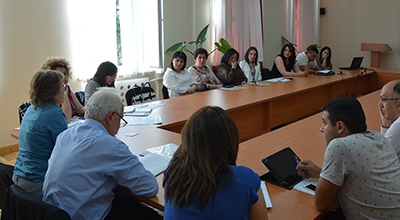 Another important activity was to develop and represent the draft version of the National Awareness Days which are anticipated to be organized in Armenia, Moldova and Belorus in 2017. 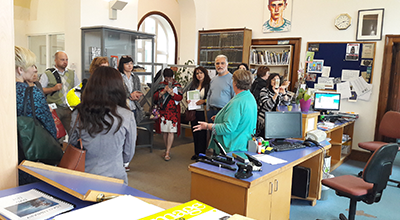 The participants of the trainings also visited the Public Library of Limerick, the library of LIT and Glucksman Library at Limerick University. 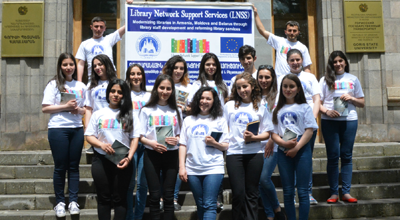 In the frameworks of the Erasmus+ “Library Network Support Services (LNSS): modernising libraries in Armenia, Moldova and Belarus through library staff development and reforming library services” Project a pilot training “English for specific needs” was launched at GSU. 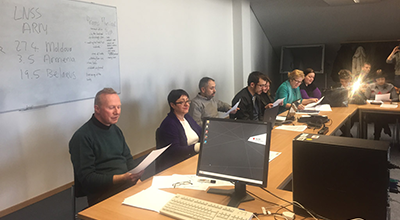 The training was designed and held for the library, faculty and administrative staff of GSU as well as for some representatives of the community librarians.Dr Angela Repanovici (Transylvania University of Brasov, Romania) and Dr Manolis Koukourakis (University of Crete, Greece) were also present at the training. This was their second project monitoring activity at GSU. 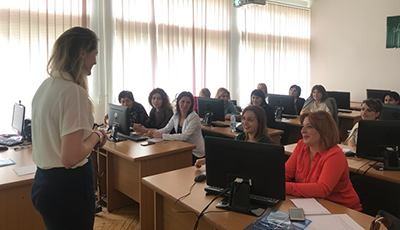 They greeted the participants of the training and expressed their satisfaction byseeingand appreciating good results of the implemented work in the framework of the project. 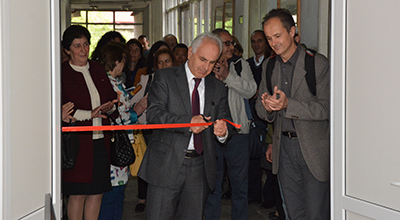 The guests and participants were welcomed by the rector of GSU Mr. Ghukasyan who highly appreciated the tangible results of the project and work directed to the modernization of libraries. He stressed the importance of including the community librarians in in the project. 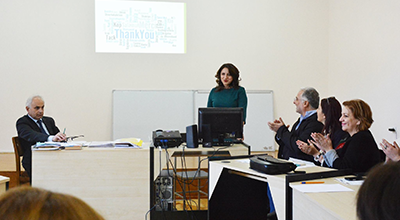 The coordinator of the project at GSU Naira Safaryan also welcomed the guests and the participants of the training and represented a report and presentation about the implementation and results of the work at GSU. 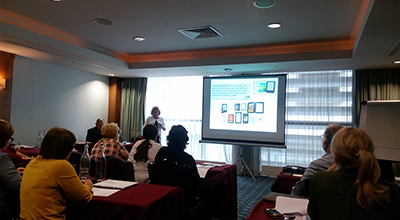 She also represented the general description and objectives of Module 1(English for Specific Purposes: Libraries, library terminology, library access). 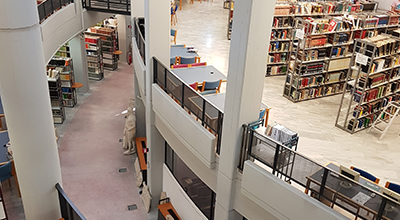 The chief librarian of GSU library Nuard Shalunts spoke about the GSU library, the newly renovated reading room and the participation of the librarians in the project. 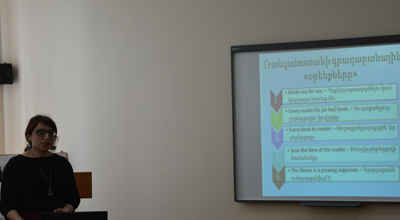 A student from the Faculty of History Astghik Isakhanyan made an interesting presentation about modern libraries and the importance of E-libraries. 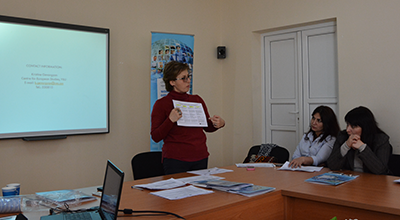 The first lesson of Module 1 was taught by the trainer Hasmik Mirzoyan. 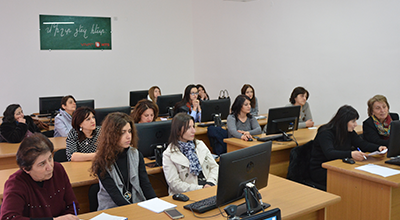 The pilot training of Module 1 (English for Specific Purposes: Libraries, library terminology, library access) in the frameworks of Erasmus+ “Library Network Support Services (LNSS): modernising libraries in Armenia, Moldova and Belarus through library staff development and reforming library services” project, which was launched on November 28, 2016, came to an end. 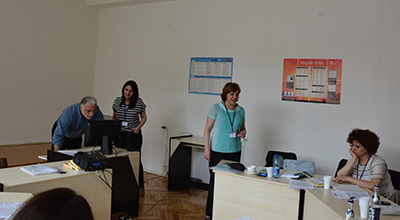 The representatives of GSU library, academic and administrative staff were participating in the last training. 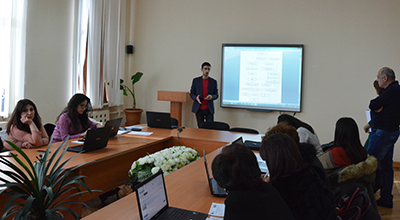 The trainers N. Safaryan and H. Mirzoyan assigned the trainees various oral and written tasks to summarize the training and to test the participants knowledge. The trainees also filled in a special student’s evaluation form and were awarded certificates. 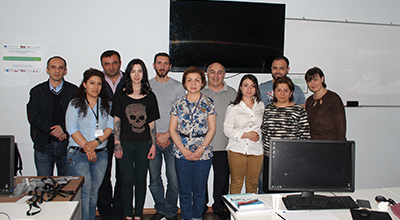 At the end of the training the participants expressed their gratitude to the trainers for the effective course and wished that similar trainings would have a continuous character. 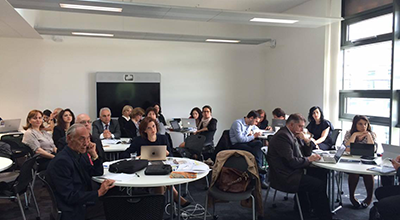 On March 1-3, 2017, TU Dresden (one of the leading universities in Germany and the largest one in Saxony) hosted the representatives of consortium member universities from EU, Armenia, Moldova and Belarus in a workshop-meeting dedicated to the annual reports of the activities in the framework of the Project during the first year of its implementation. 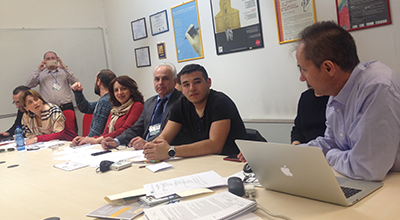 The project coordinator Naira Safaryan and the trainer HasmikMirzoyan from GSU participated in the meeting. 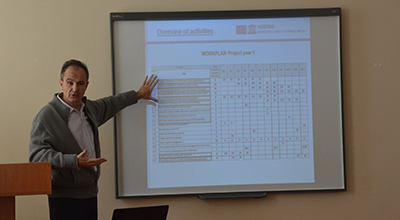 The Project coordinator T. Khechoyan delivered a general report on the Project activities. 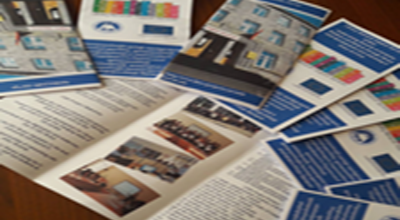 The representative-members of the Consortium from nine universities of three Eastern Partnership Countries (Armenia, Moldova and Belarus) and four universities of European Union (Ireland, Germany, Romania and Greece) made reports on their activities since the beginning of the project and presented their drafts of National Library Awareness Day. 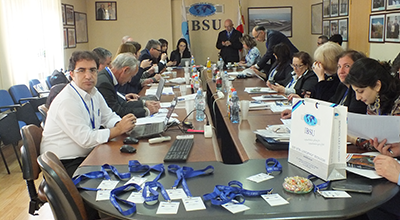 The workshop took place together with the representatives of the consortium of a similar LNSS project implemented in Western Balkans. 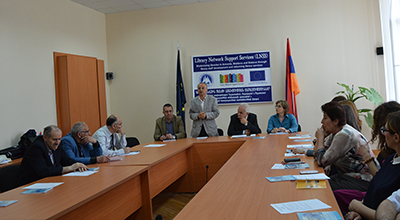 It provided an opportunity to draw parallels between the activities of LNSS projects of the two regions and exchange their experience and skills. 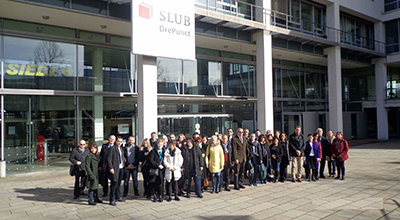 The participants also visited Saxon State and University Library, Dresden (SLUB). 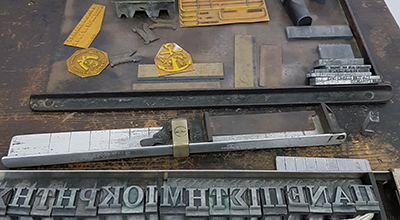 Along with its collection of about nine million pieces, it also comprises the largest public archive in Germany and a museum of ancient manuscripts. 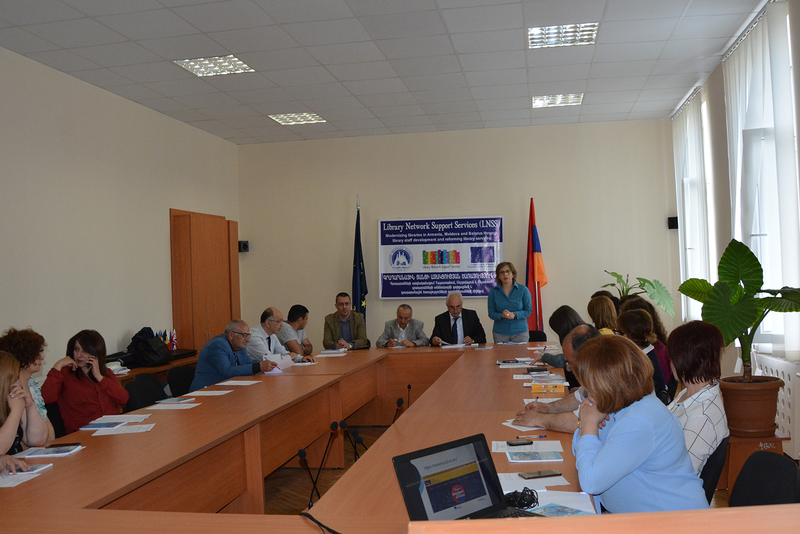 The presentations and discussions of the activities implemented in the frameworks of Erasmus+ LNSS (Library Network Support Services: modernizing libraries in Armenia, Moldova and Belarus through library staff development and reforming library services) and HERITAG (Education interdisciplinary Reform in Tourism management and Applied Geoinformation curricula) projects took place at the conference hall of GSU, on April 11, 2017. 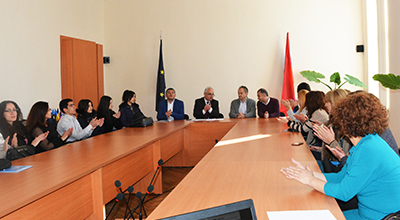 The rector of GSU, representatives of the academic and administrative staff as well as guests from the town hall and local NGOs were present at the event. 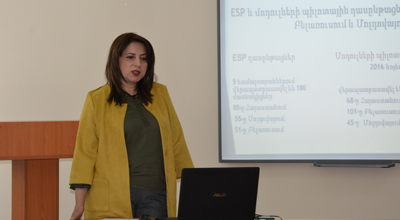 The coordinator of LNSS at GSU N. Safaryan delivered a report on LNSS project objectives, the activities implemented in the frames of WPs, trainings, SWOT analysis, Module 1(English For Specific Purposes: Library Context, Libraries, library terminology, terminology around library access), the piloting of the module and its results, the newly renovated and equipped library reading hall(as co-funding in the project), the preparation work for the National Awareness Day and future activities. 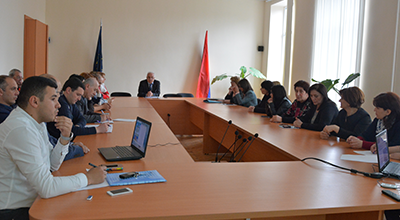 The coordinator of HERITAG project at GSU H.Babayan made a presentation about the mutual visits and cooperation results of the partner countries, the survey at the beginning of the project, the involvement of the stakeholders and the activities of the members of GSU working group. 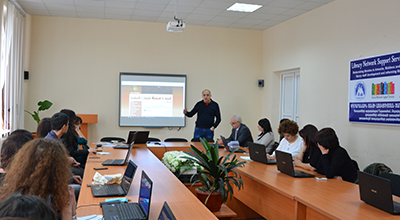 As a key member of the project working group G. Minasyan spoke referring to the objectives of the project, the future master specialty, the clarification of the course materials and subjects and the planned actions for the creation of a GIS lab at GSU. 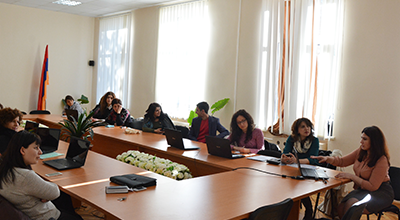 The reports and presentations were followed by active discussions and questions concerning the strategic plans, objectives and expected outcomes of LNSS project, the creation and digitization of E-library, the threats revealed in the result of SWOT analysis, the market demand of the future GIS specialists in general and particularly in the region, the issue of the awareness of the students and stakeholders, the creation of the Advisory Board and involvement of new members in the projects. 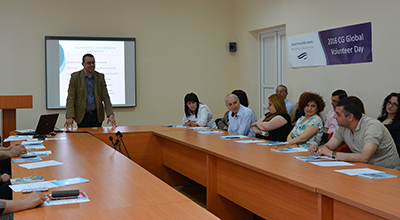 A range of events devoted to Library National Awareness Day under the slogan “A gateway to knowledge” was held on May 3, 2017, at Goris State University in the frameworks of Erasmus+Library Network Support Services (LNSS): modernizing libraries in Armenia, Moldova and Belarus through library staff development and reforming library services Project. 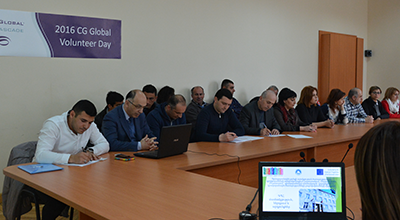 The participants of the event were welcomed by the rector of GSU A. Ghukasyan who emphasized the purpose of the day, the role and importance of the awareness for the best organization of the library work. 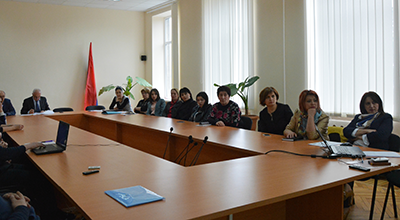 The coordinator of the project at GSU N. Safaryan delivered a report about the objectives, the implementation of the work packages, the trainings and workshops within the project, its tangible results, the measures undertaken aiming at the modernization of the library as well as the Library National Awareness Day. 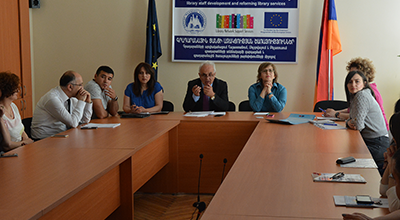 The chief librarian of the library N. Shalunts made a presentation about the involvement of the GSU library in the project, the mutual meetings, discussions, trainings and the exchange of best practices among the consortium member university libraries and librarians of the project, the newly reconstructed reading hall as well as the preparation work for the digitization process at GSU library. The secretary of the Students’ Scientific Association, a four-year student of the Faculty of Humanities and Social Sciences S. Alaverdyanmade an impressive informative presentation about the most beautiful and unique libraries of the world and her perception of the libraries in general. 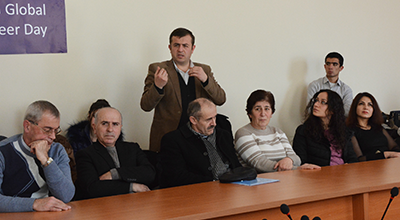 The first part of the event wassummarized by active discussions, exchange of opinions and useful suggestions by the representatives of GSU academic and administrative stuff, town municipality, community librariesand Media. 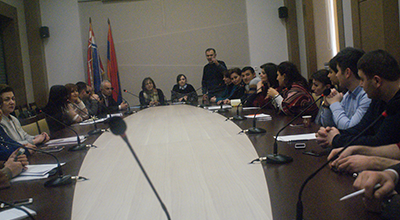 The second part of the event took place at the GSU library reading hall where the participants students welcomed the guests and made a literary-cultural presentation about ancient libraries and the first printed Armenian books as well as the life and works of the great Armenian poet Hovhannes Shiraz. This was followed by a flash-mob event initiated and organized by the students. The purpose of the flash-mob was to inform the community about the Library Awareness Day. 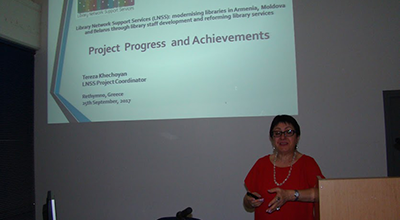 In the frameworks of the Erasmus+ “Library Network Support Services (LNSS): modernizing libraries in Armenia, Moldova and Belarus through library staff development and reforming library services” Project Quality Assurance training was held at the University of Crete, Rethymno, on September 24-30, 2017. 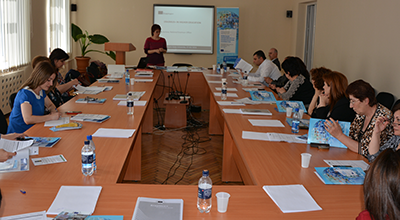 EU experts and the representatives from the project partner institutions were participating in the training. 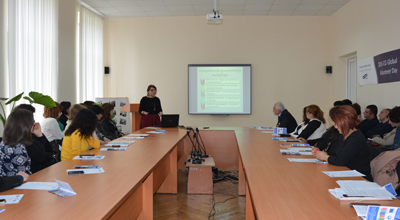 The event took place at the library building of UOC. The project coordinator Tereza Khechoyan delivered a welcome speech and made a presentation on the course, activities, overall progress and tangible outcomes of the project so far by stressing the success in developing the eight modules and their piloting at the partner institutions, the successful organization and implementation of the NADs in the partner countries, as well as the trainings and the impressive numbers of the trained staff. 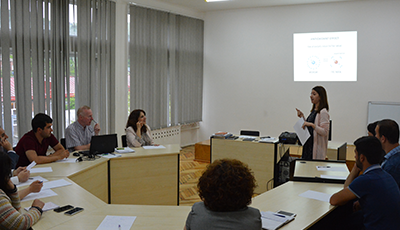 The trainings covered the following topics: • Quality Management and Quality Assurance • EU Quality standards and Quality Assurance for managing EU funded projects • EU Quality standards and QA for Higher Education. • EU Quality standards and QA for Public Sector Institutions • Risk management • English as a Medium of Instruction (EMI). 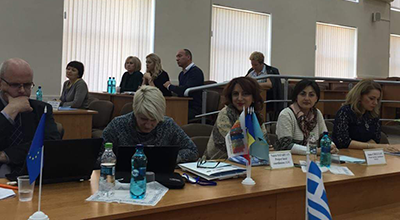 EU Quality standards and QA for Higher EducationManolisKoukourakis (UOC) represented ManolisKoukourakis (UOC) and Liliana Rogozeva (Vice rector at the University of Transylvania) represented the QA related activities and implementation processes in their respective HEIs. 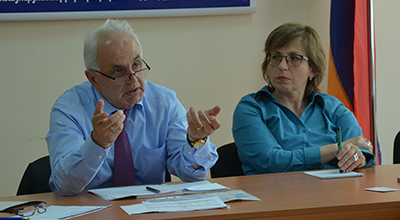 ManolisKoukourakis(UOC) , Angela Repanovici(University of Transylvania) presented their SWOT analyses of the NAD in Armenia and Gerry Cullen(TPG) presented that of Moldova and made their remarks and gave recommendations. 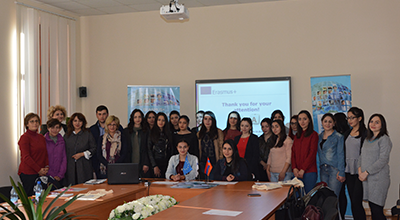 During the training week, each PC partner institution represented the activities and impact of the National Awareness Days. 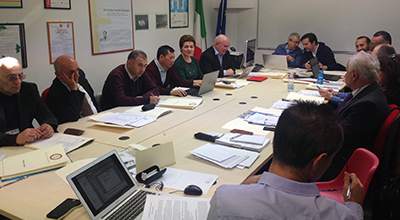 After the QA trainings, the partners were assigned to review, update and choose another module for the second piloting according to their priorities and needsThe terms and schedules were discussed and it was decided that the second piloting should start in November and finish by December 10. Gerry Cullen suggested that the modules be integratedinto the university’s curricula, library and administrative staff recruitment trainings etc. 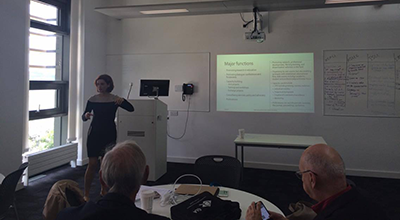 He also made a presentation “English as a Medium of Instruction” As more universities use English as a Medium of Instruction (EMI), the need for structural changes, different methodologies is becoming more urgent. 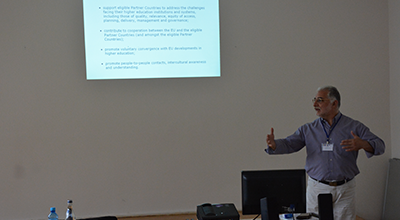 Gerry Cullen spoke about their experience at TU Dresden and the challenges and ways of overcoming them. 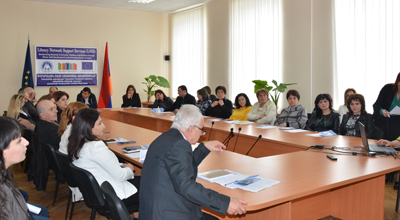 He emphasized the importance of the introduction and implementation of ESP courses in various academic programs as well as staff recruitment and training programs at any academic institution in order to be responsive to the dynamic changes in the competitive global higher education market For the purpose of experience exchange, the participants of the trainingwere invited to take a tour at UOK library and the newly constructed Central Public Library of Rethymno. 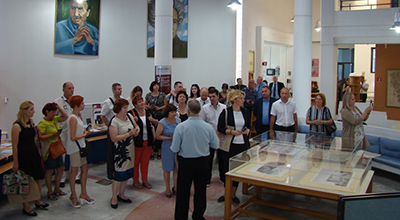 They were introduced to theOpen access, Reference, Short loan and Close accesscollections, the archives, the preservation departments, the European documentation centre, as well as the museum of the library. The collection of rare books, which deal with Greek history and civilization and the wide collection of periodicals were especially impressive. 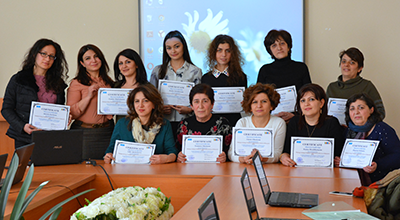 The participants were awarded certificates of participation in QA trainings. 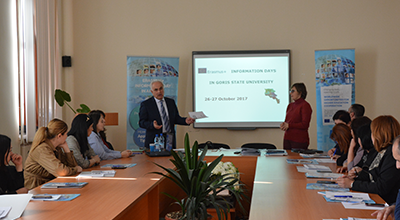 On October 26-27, 2017,Erasmus+ Information Days were held atGoris State University. 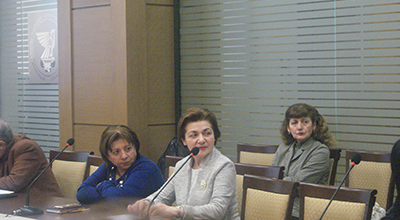 Rector of GSU A. Ghukasyan, National Erasmus+Programme CoordinatorLana Karlova, Programme officers Edith Soghomonyan and AniTorosyan, as well as Expert in European Studies and HE Kristine Gevorgyan were present at the two-day event.On the first day of the events Lana Karlova announced about the publishment of Erasmus+ NEW Call for Proposals and represented about the applications and proposals for K2, 2018 /Capacity Building Projects/based on the national and regional priorities. 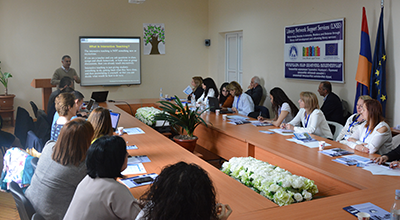 The second session of the day related to the two ongoing projects at GSU; Erasmus+ “Library Network Support Services (LNSS): modernizing libraries in Armenia, Moldova and Belarus through library staff development and reforming library services” and HERITAG (Education interdisciplinary Reform in Tourism management and Applied Geoinformation curricula), their implementation, problems, progress, the current course of the digitization and expansion of the library and the creation of a geoinformation laboratory at GSU. 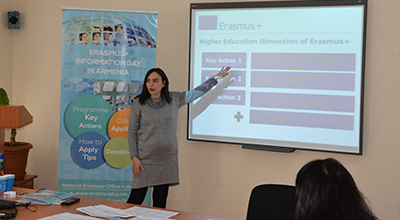 On the second day of theevent Expert in European Studies and HE Kristine Gevorgyan made a presentation on the steps of applying for Erasmus+ Jean Monnet Actions and represented the experience of YSU in it. 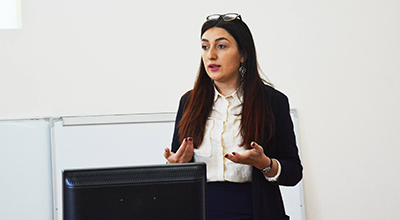 Erasmus+Programme officer AniTorosyan represented the opportunities of the International Credit Mobility for both the academic staff and the students (including Traineeships as a novelty). 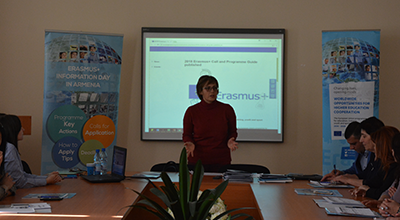 During the second session Erasmus+Programme officer Edith Soghomonyan made a detailed presentation about Erasmus Mundus Joint Master Degrees (EMJMDs) for the students of GSU. 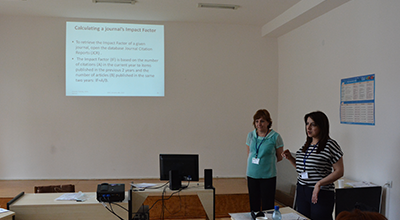 She spoke about the application procedure and some statistics on the Armenian students’ participation in this project. 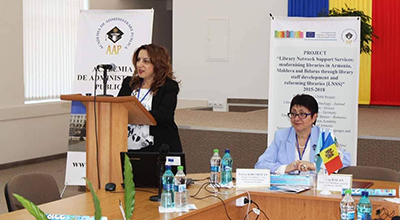 In the frameworks of the Erasmus+ “Library Network Support Services (LNSS): modernizing libraries in Armenia, Moldova and Belarus through library staff development and reforming library services” Project a pilot training “Information Literacy and Research Skills” was launched at GSU on November 27, 2017. 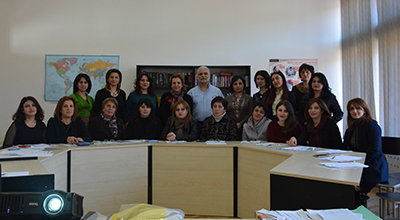 The training was designed and held for the library, faculty and administrative staff of GSU, as well as for some representatives from the library of the House of Culture after GusanAshot and Children’s library of Goris community. 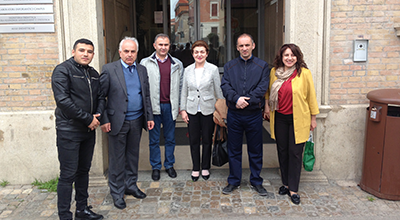 The EU experts Dr Angela Repanovici (Transylvania University of Brasov, Romania) and Dr. ManolisKoukourakis (University of Crete, Greece) were also present at the training. This was their third project monitoring visit to GSU. 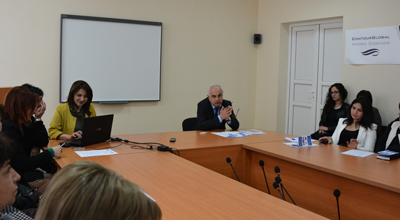 The guests and participants were welcomed by the rector of GSU Mr. Ghukasyan who emphasized the start, importance and expected outcomes of one of the most important events in the frameworks of this international project. 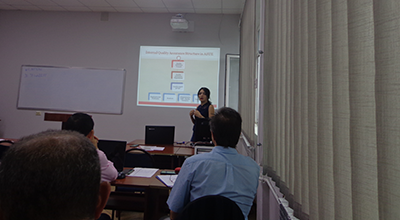 The coordinator of the project at GSU Naira Safaryan also welcomed the guests and the participants of the training and made a presentation about the module, its description and objectives. 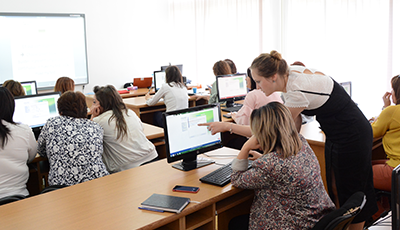 Module 4 “Information Literacy and Research Skills” covers the following topics: • Information Technologies • The Importance, development tendencies and application of the Internet • The role of libraries in Information Literacy & Research skills • Digital Literacy • Information Search Process in the modern world. • Search systems; Scopus, Web of Science, Science Direct • Information Depositories and databases • Library Development Strategy • Automatic Management Systems for Libraries (KOHA) At the end of the first session of the day Dr. ManolisKoukourakis took the floor and positively spoke about the content, organization, active participation of the trainees, the professionalism of the trainers in particular and the visible results and progress of the work implemented in the frames of the project. 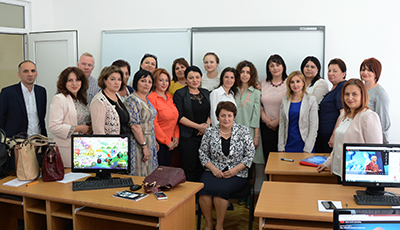 The piloting training of Module 4 “Information Literacy & Research skills” in the frames of Library Network Support Services (LNSS): modernizing libraries in Armenia, Moldova and Belarus through library staff development and reforming library services) project came to an end. 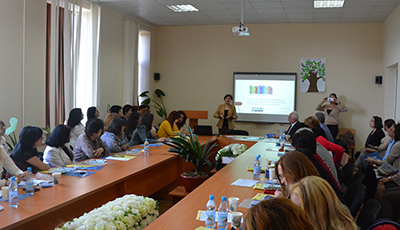 The librarians, the representatives of the academic and administrative staff of GSU, as well as some representatives of community libraries and the library of the House of Culture were participating in the trainings. The trainings were held on November 27-December 10 at GSU. 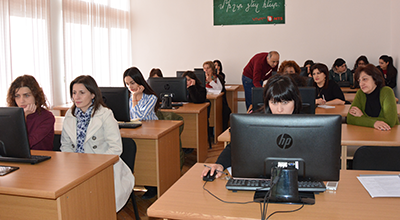 The trainings were held in the classrooms equipped with computers so that the participants of the trainings could have the opportunity to apply theoretical knowledge in the practice. 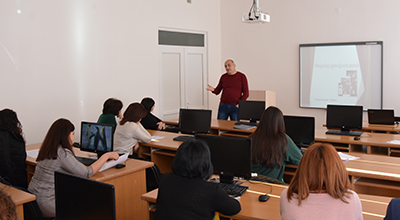 The trainings were delivered by N. Safaryan (Person in Charge of International Cooperation and Projects and LNSS Coordinator), A. Vardazaryan(IT Specialist) and A. Ordyan (Assistant Professor at the Chair of Mathematics and Informatics and Project Working Group Member). 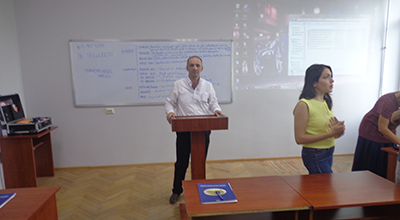 On the last day of the trainings, GSU Rector A. Ghukasyan was present at the closing part. He delivered a speech by emphasizing the importance of holding such trainings at GSU. 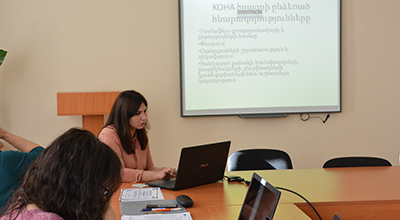 After the heated discussions and exchange of opinions about the importance and knowledge gained during the trainings, as well as the attempts of applying the library management automatic system(KOHA) by the participants of the training, the rector noted that it is vital to use this knowledge and skills in practice, i.e. in the introduction of the library management automatic systems into the library, the E-library, as well as the reconstruction and updating process of the Library division of GSU official website. 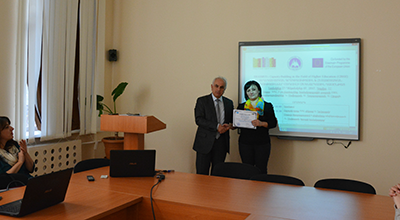 The participants of the training were awarded certificates. 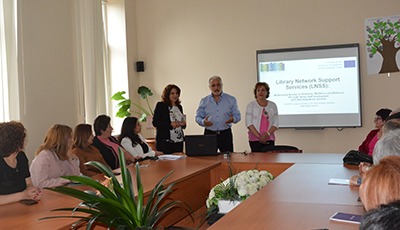 On April 5, 2018 a monitoring meeting in the frames of “Library Network Support Services (LNSS): modernizing libraries in Armenia, Moldova and Belarus through library staff development and reforming library services” project took place at PAARA. 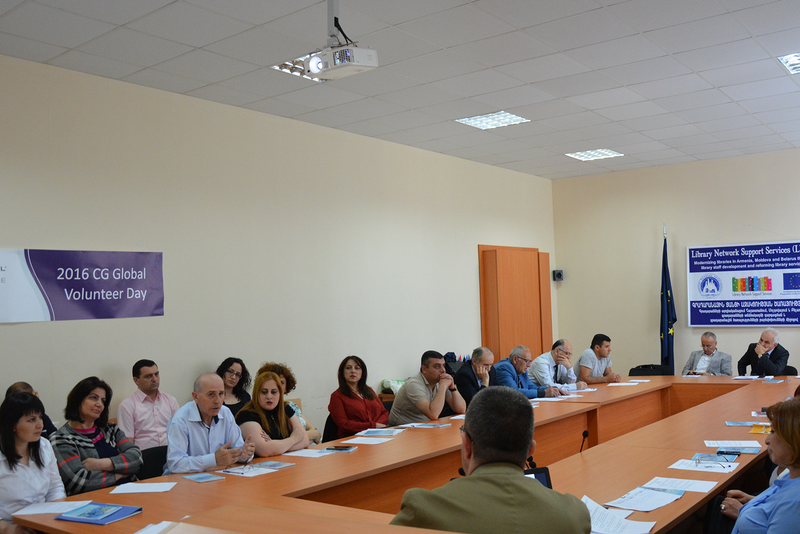 The Coordinator of the project at GSU N. Safaryan, the Chief of the library N. Shalunts and the project working group members A. Ordyan and A. Dinunts represented GSU at the meeting. 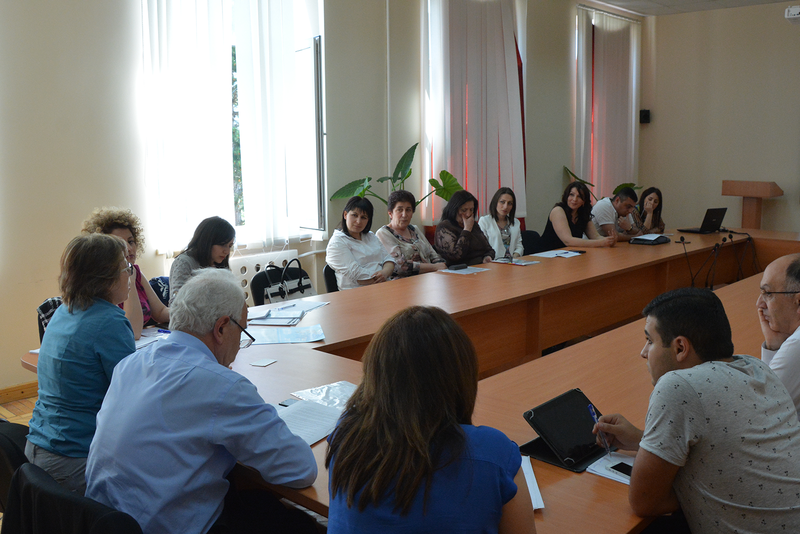 The representatives of the academic and administrative staff and students from PAARA were also present at the meeting. 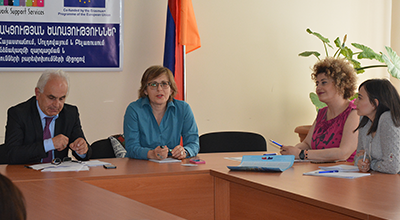 The monitoring visit was initiated by the representatives of National Erasmus+Office in Armenia Lana Karlova (Programme Coordinator) and Edith Soghomonyan (Programme Officer). 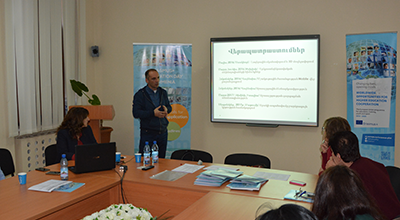 The coordinator of the project T. Khechoyan(PAARA) represented the activities implemented during the first two years of the project. 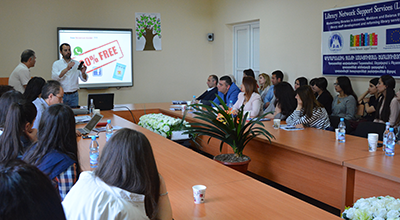 The local coordinator of the project at GSU N. Safaryan spoke about the activities implemented at GSU in the frames of the project, particularly the piloting trainings of two modules: ENGLISH FOR SPECIFIC PURPOSES (LIBRARIES, LIBRARY TERMINOLOGY, LIBRARY ACCESS) AND INFORMATION LITERACY AND RESEARCH SKILLS, National Awareness Days (May 3, 2017 and the upcoming June 1, 2018), the qualitative and quantitative outcomes of the projects, the purchase of the equipment etc. 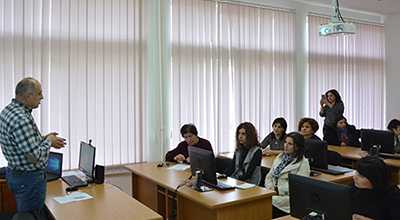 A. Ordyan and N. Shalunts spoke about the digitization process and the implementation of the library management system KOHA at GSU library. 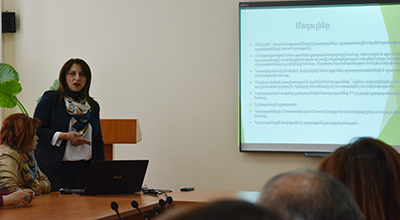 A.Dinunts gave a detailed description of the positive outcomes and impact of the project at GSU. 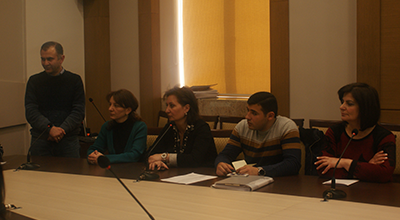 This was followed by questions addressed to the participants of the meeting aiming to reveal their opinions and points related to the project implementation at the partner institutions. 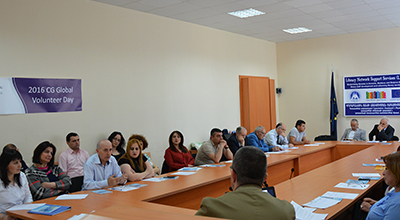 Some problems relating to the organization of the National Awareness Day June 1, 2018, the purchase of the new equipment and literature were also discussed. 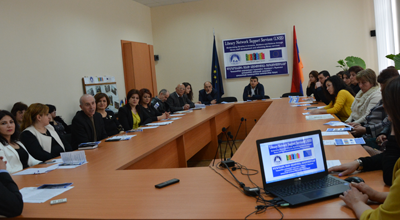 National Erasmus+Office in Armenia is going to represent a report on the results of the monitoring to the Education, Audiovisual and Culture Executive Agency(EACEA), which in its turn will produce a report and an evaluation and represent to the member institutions of the consortium. 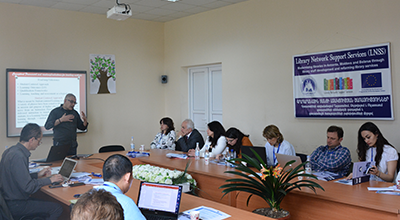 A workshop devoted to the National Awareness Day of Librariesin the framework of Erasmus+ “Library Network Support Services (LNSS): modernizing libraries in Armenia, Moldova and Belarus through library staff development and reforming library services” project took place at Goris State Universityfrom May 31 to June 1, 2018. 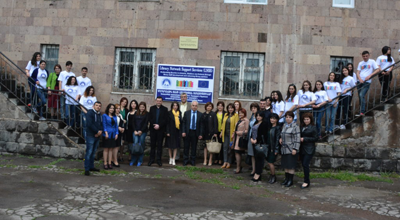 Armenian institutions participating in the project as well as European partners and the staff of regional and municipal libraries of Syunik were participating in the event. 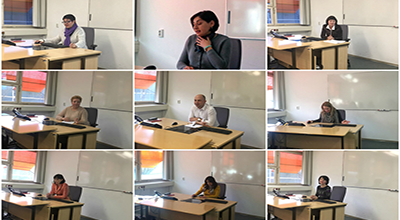 A master class ‘How to become a better teacher by using information and communication technologies’, which was led by EU experts Angela Repanovici (Transylvania University of Brasov, Romania) and ManolisKoukourakis (University of Crete, Greece) on May 31. 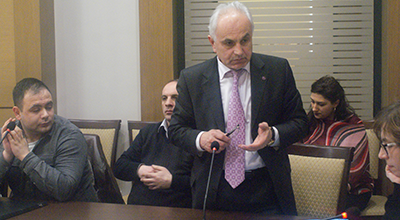 At the opening of the workshop, ArtushGhukasyan, Rector of GSU delivered a welcoming speech by appreciating the decision of holding the National Awareness Day events at GSU. 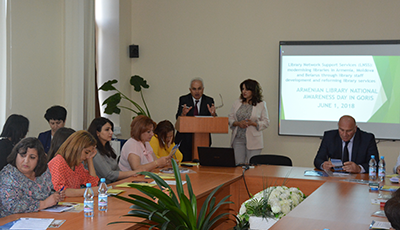 By referring to LNSS project, the rector emphasized the main points related to the digitization and modernization of libraries, the enrichment of the electronic collections, the development of the professional skills and capacities of the library staff, the acquisition of the necessary equipment for the libraries and, most importantly, the integration in the national and international library networks, which make LNSS an ambitious and yet a justified project.ArtushGhukasyan, Rector of GSU and Naira Safaryan presented the activities implemented at GSU in the frames of the project, tangible outcomes as well as the future action plan. 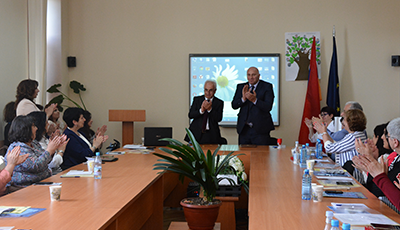 ArsenLokyan, Rector of Public Administration Academy of RA, which is the project coordinating institution, also greeted the participants of the workshop and expressed gratitude for the warm welcome by GSU. 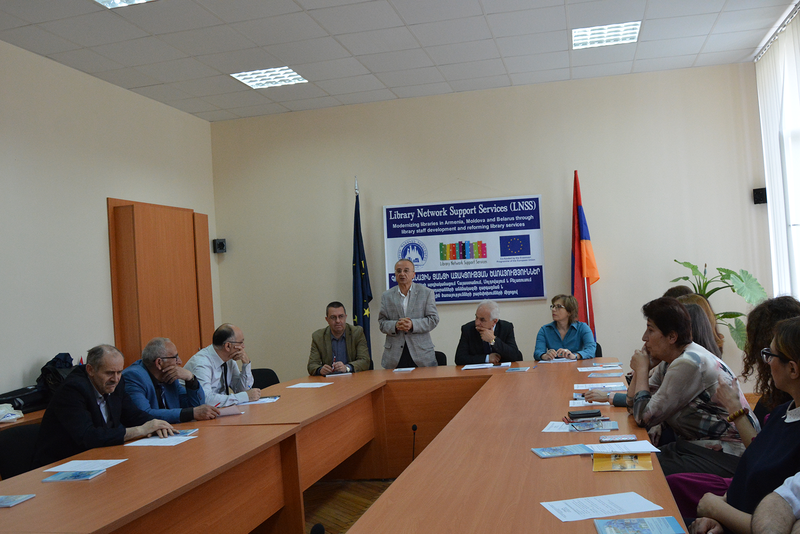 By highly appreciating the close cooperation and friendly relationships between the partners, Mr. Lokyan also thanked the Erasmus+LNSS management and the European partners for the assistance and necessary consultancy during the project implementation period. 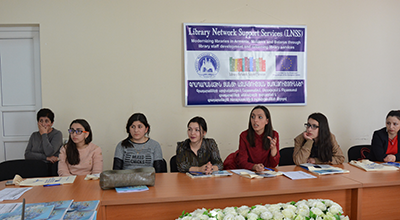 He also referred to the main goal of LNSS which intends to the development of the libraries, modernization and improvement of the quality of library services, which in its turn, will contribute to the development of the education etc. Mrs. TerezaKhechoyan, Vice-rector of Public Administration Academy of RA and Coordinator of LNSS project started her speech by expressing her gratitude to the EU experts Gerard Cullen, Angela Repanovichi, ManolisKoukourakis, Jerald Cavanagh and Padraig Kirby who represent the ‘Pyramid’ group (Germany), Transylvania University of Brasov (Romania), University of Crete (Greece) and Limerick Institute of Technology (Ireland) for the great assistance in the project. 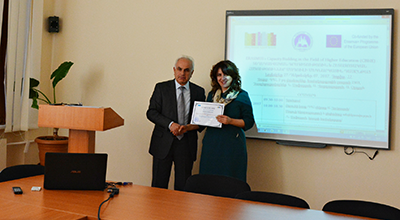 Mrs. Khechoyan presented the achievements of the project over the past three years: the trainings for librarians, academic staff and students, the eight modules aiming to train the library staff designed by the partner institutions and two pilot trainings for librarians, which have been implemented at the partner universities of the consortium in Armenia, Belarus and Moldova. 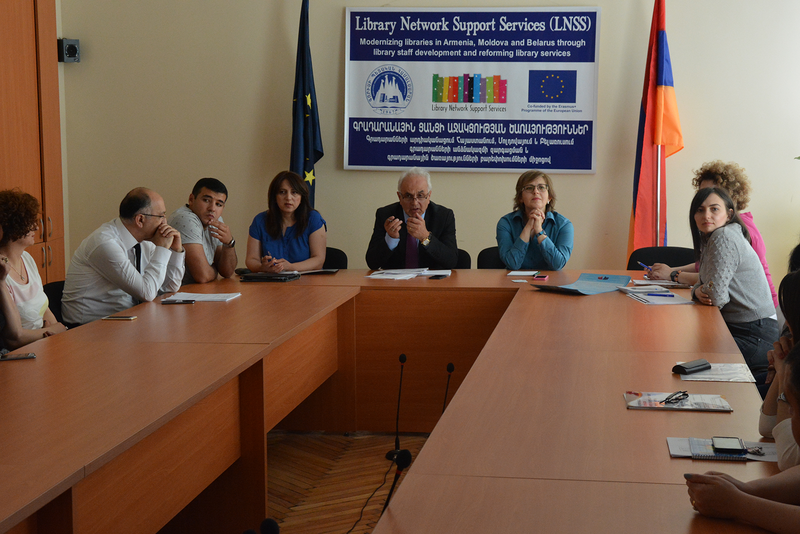 5.”Improving quality of library services”-ArturVardazaryan, New Horizon NGO, Armenia. 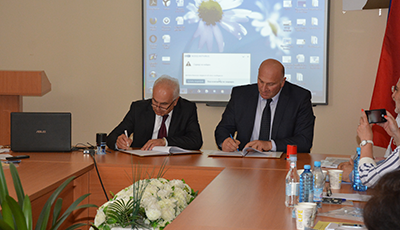 At the end of the workshop day A. Lokyan – Rector of Public Administration Academy of RA, and A. Ghukasyan – Rector of Goris State University signed an Agreement of Cooperation, which aims at drafting and realizing mutually beneficial projects in the sphere of education and science. 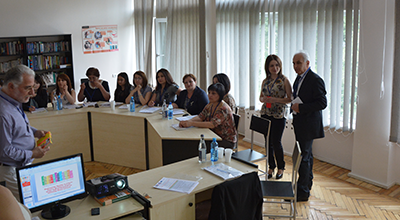 A two-day training ‘’English as a Medium of Instruction’’ in the framework of Erasmus+ “Library Network Support Services (LNSS): modernizing libraries in Armenia, Moldova and Belarus through library staff development and reforming library services” project took place at Goris State University from June 4 to 5, 2018. 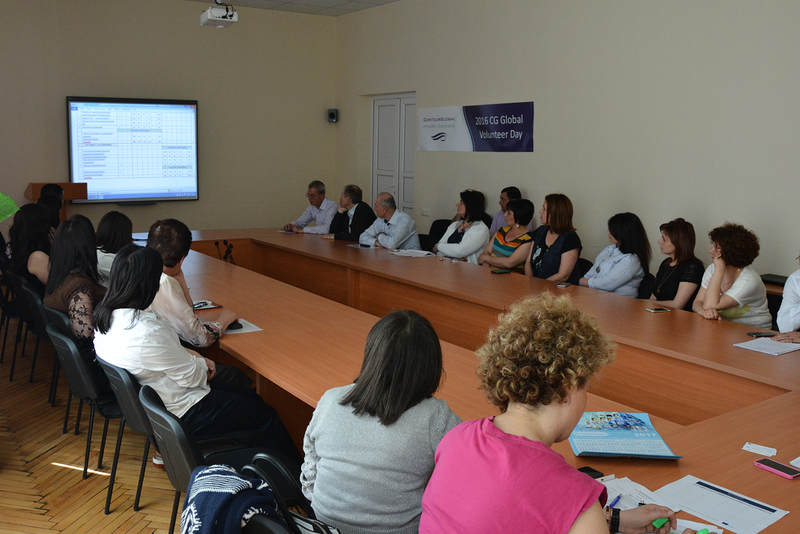 The training targeted at the academic, administrative and library staff of GSU. 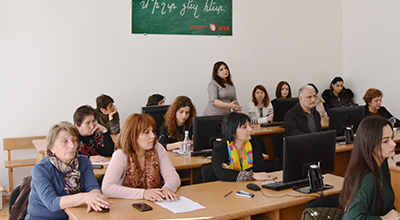 It aimed to improve and strengthen the knowledge of English as well as to develop communication skills and the ability to use English as a means of instruction. 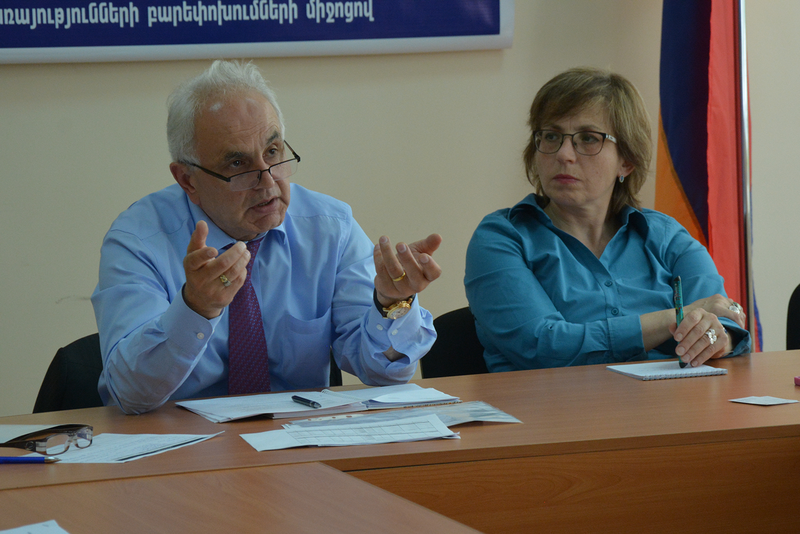 The trainings were held by EU experts Gerrard Cullen and Valeria Racheva. 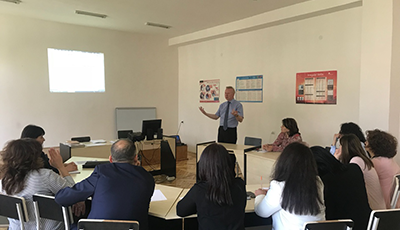 At the beginning of the first day of the trainings Gerrard Cullen delivered a speech by highly appreciating the willingness of GSU staff to learn English as the knowledge of English is vital in the processes of internationalization, fostering the staff and students’ mobility etc. 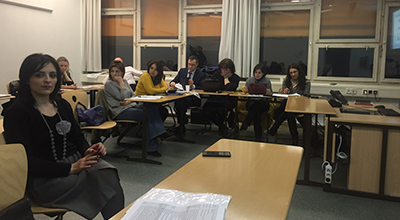 By referring to the practice of the organization of the teaching processes at European HEIs, Gerrard Cullen mentioned the fact that many of the courses in various specialties are currently delivered in English as a considerable part of the students are from abroad. 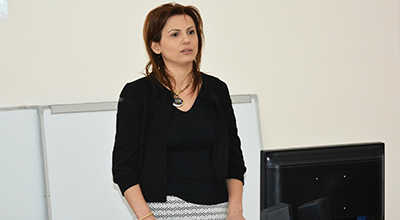 On the second day of the training the participants of the training Lilit Atabekyan, Dean of the Faculty of Natural Sciences, GurgenMinassyan, Acting Head of the Chair of Economics and ArpineOrdyan, Assistant Professor at the Chair of Mathematics and Informatics delivered lectures and made presentations in English by using the methods and instructions given by the experts. This was followed by an interesting discussion. 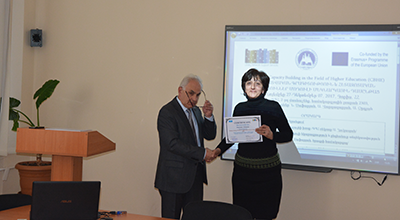 Around 40 participants were awarded certificates for the participation in the trainings. 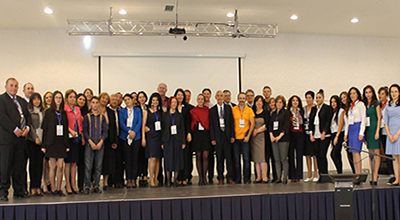 Erasmus+ “Library Network Support Services (LNSS): modernizing libraries in Armenia, Moldova and Belarus through library staff development and reforming library services” Project final Management Meeting and Conference took place in Moldova on October 3-5, 2018. 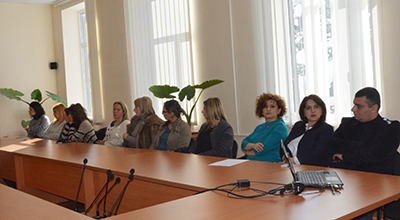 The Academy of Public Administration of Moldova hosted the representatives of member institutions of the Project from Armenia, Belarus, Moldova, Ireland, Germany, Romania, Greece, the Ambassador of Armenia in Moldova, the representatives of Erasmus Office in Moldova and other respectable guests. 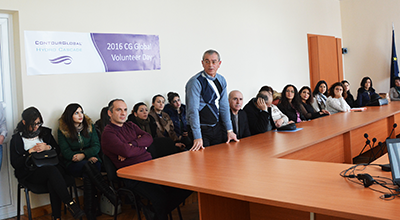 The project local coordinator N. Safaryan, the GSU Chief of the library N. Shalunts and the librarian A. Tangyan represent GSU at the event. 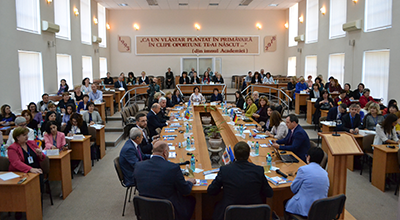 Oleg Balan, Rector of Academy of Public Administration of Moldova, ArsenLokyan, Rector of Public Administration Academy of RA and Claudia Melinte, Head of National Erasmus+ office in Moldova, greeted the guests. 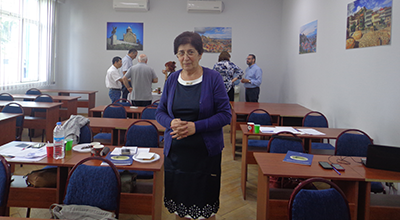 PAARA Vice-rector and LNSS Project coordinator TerezaKhechoyan presented the activities and achievements of the Project during the recent three years. 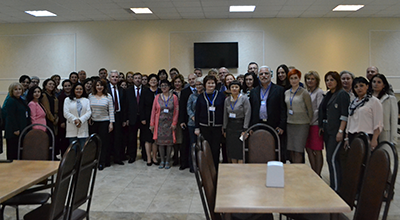 The local coordinators of all institutions of the consortium represented detailed reports on activities carried out within the lifetime of LNSS, Project’s overall achievements, tangible outcomes and impact on their institutions, the design of 8 modules, the implementation of pilot and other trainings, the purchase of the equipment, the new library services, the project official website etc. 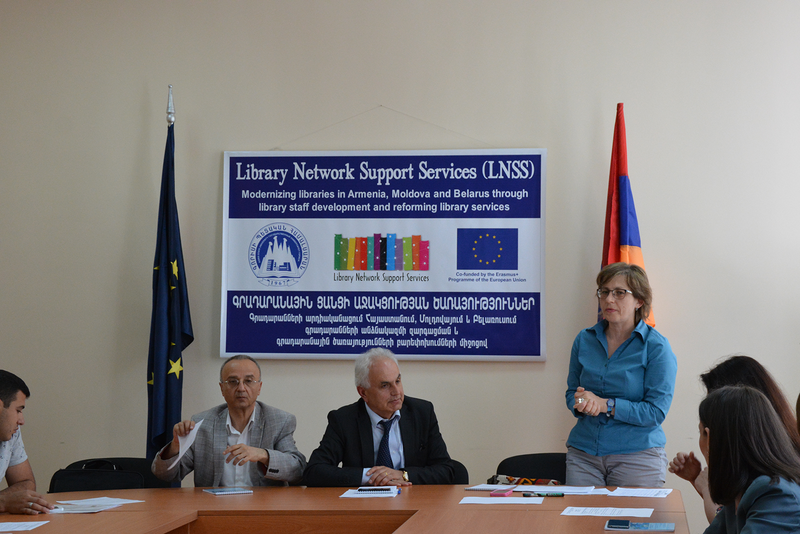 GSU local coordinator N. Safaryan particularly referred to the importance of the availability of newly reconstructed(cofounding) library reading hall which is reequipped with the equipment purchased by the project fund and has made it possible to improve the library services, to digitize the databasese and integrate into the local and international library network. 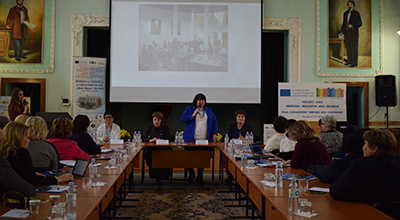 She also spoke about the high awareness of the project and the availability of prerequisites and beneficial conditions for present and future cooperation and relations with the community and regional libraries. 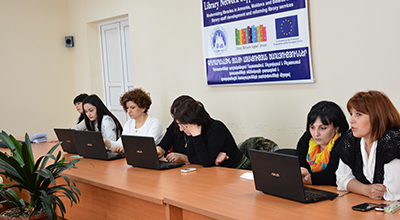 The various trainings within the project contributed to the development the professional capacities and skills not only among the GSU academic, administrative and library staff but also those of community libraries. 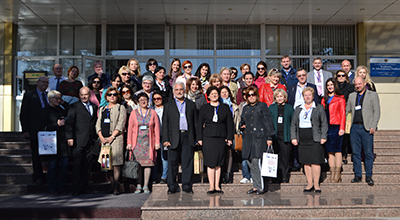 On October 4 the participants of the conference were hosted by Alecu Russo Balti State University. 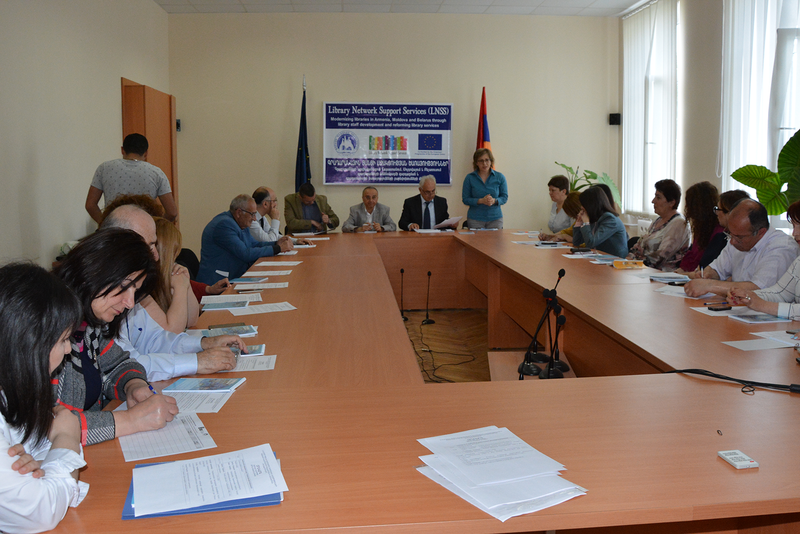 The representatives of European partner institutions presented the results of their activities. 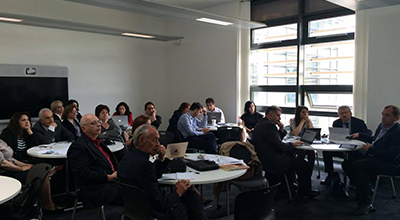 Gerard Cullen and Angela Repanovici spoke on the rationale of EMI in LNSS. The Irish partners Gerald Cavanagh and Padraig Kirby touched upon the participation of Limerick Institute of Technology in the Project. 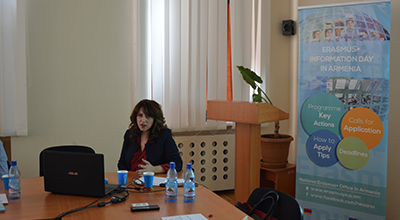 Angela Repanovici from Transilvania University of Brasov made a presentation ‘’LNSS Armenia, Belarus and Moldova Survey: Methodology and Results at the End of the Project’’. 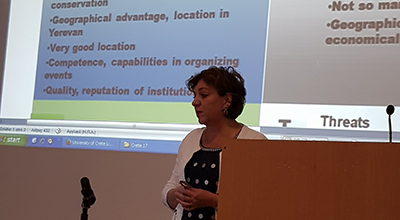 ManolisKoukourakis, Head of the library of the University of Crete presented the summary of student evaluation feedbacks from pilot trainings. Heads of libraries of Belarusian State University Vladimir Kulazhanka, (“The LNSS Project and the Development of the Network of Open Access Repositories in Belarus”), Anna Chulyan, Yerevan Brusov State University of Languages and Social Sciences (“Open access in Armenia”) and Elena Harkonita, Alecu Russo Balti State University (“Innovative Services Developed within LNSS Project”) made presentations on their experience in development of library services in their institutions. 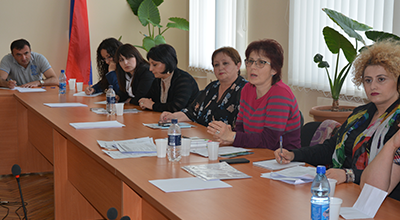 The financial manager of the project MananaSulukvadze represented a detailed report on the financial implementation and the budget of the project. There were a lot of various discussions on the project sustainability and the design of the future joint projects of cooperation. 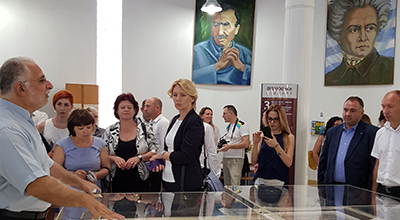 The participants of the conference also visited the libraries of the two Moldovan partner institutions, got acquainted with the process of their everyday work, repositories and witnessed the tangible technical re-equipment due to the LNSS Project. On the last day of the conference the heads of libraries of 9 institutions of the three EU Eastern Partnership countries– Armenia, Belarus and Moldova, signed a Memorandum of Cooperation and Partnership, which aims to ensure the future cooperation between Armenia, Belarus and Moldova in the fields of science, education and culture, the development of an information literate society and sharing best practice and experience in development and improvement of the library services and professional skills and capacities among the librarians. 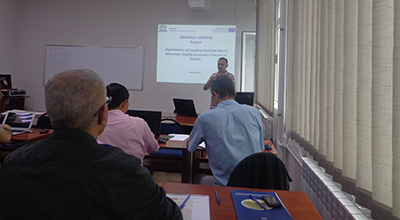 Two training courses of ‘‘Basic GIS for Economics and Tourism’’ in the framework of Erasmus+ HERITAG project were held in Tbilisi on April 23-30 and June 18- 25, 2016. 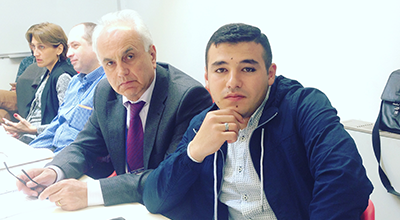 Two participants from GSU, Gurgen Minasyan, Head of the Chair of Economics and Hayk Martirosyan, Lecturer at the Chair of Electronics took part in the trainings. The international project Erasmus +HERITAG (Education interdisciplinary Reform in Tourism management and Applied Geo-Information curricula) has partners from four European countries (Italy, Spain, Sweden, Greece) and several universities and tourism organizations from Georgia and Armenia such as Armenian State University of Economics (ASUE), National University of Architecture and Construction of Armenia (NUACA), Goris State University (GSU), Center for Education Reform Armenia and Union of Incoming Tour Operators of Armenia (UITO). 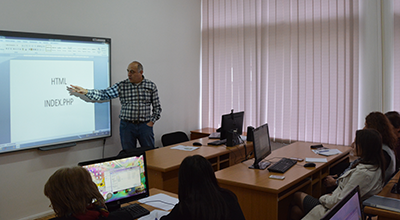 The GIS training courses were held in two stages which were mainly oriented on GIS maps, pinning down geographic data, symbolizing quantitative data, analyzing spatial relationships, making map layout, editing and analyzing GIS data, as well as solving GIS related problems. 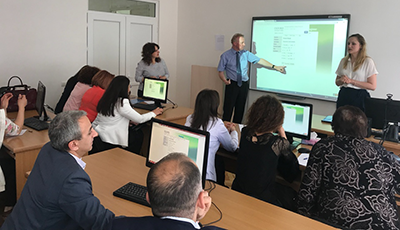 During the trainings the Georgian experts delivered theoretical lectures and introduced the participants the GIS application process right on the spot, in different districts of Tbilisi. The project aims at the development of tourism business and the introduction of the GIS technology into the education process. Eventually the GSU participants of the GIS trainings will apply the knowledge and experience gained at the trainings at our university particularly in the new Master program “Tourism Management” and at the GIS laboratory at GSU. 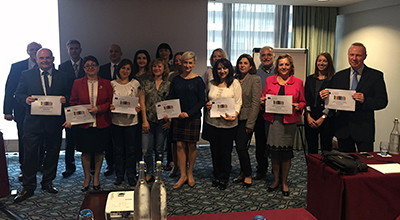 On October 30 to November20, 2016 the training “Tourism Entrepreneurship” within the framework of ERASMUS + HERITAG project was held in Valencia, Spain. 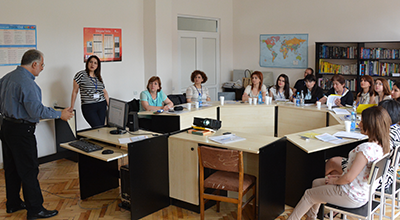 Two participants from GSU Hayk Babayan, specialist at the Department of International Cooperation and Quality Assurance and HERITAG project Coordinator and Gurgen Minasyan, Head at the Chair of Economics participated in the trainings. The project aims at the development of tourism business and the introduction of the GIS technology into the education process. 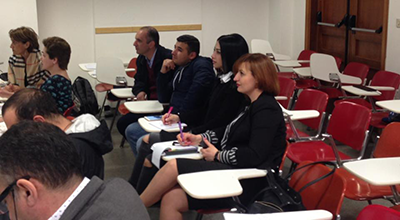 The program of the training “Tourism Entrepreneurship” included: • Introduction to the Start Up School of Valencia Polytechnic University • lectures on enterprises and business models, • group workshops of the creation and presentation of business plans. 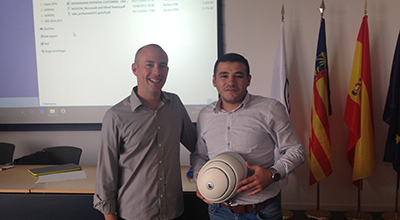 A site visit to the Start Up Center of Valencia Polytechnic University was organized on the last day of the trainings. 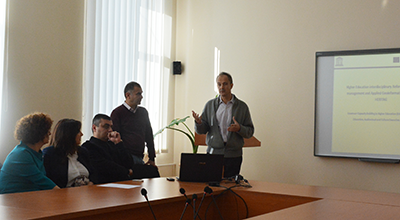 On December 16 in Goris State University were invited HERITAG (Education Interdisciplinary Reforms in Tourism management and Applied Geoinformation ) education program coordinator professor at the Polytechnic University of Valencia Luis Angel Ruiz Fernandez and HERITAG program coordinator in Armenia professor at the National Polytechnic University of Armenia Varazdat Hovhannisyan. 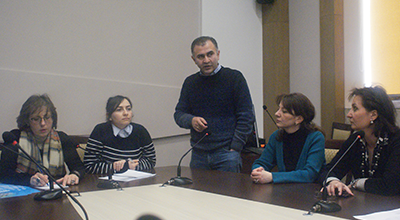 The meeting were attended GSU Rector Artush Ghukasyan, HERITAG Coordinator at GSU Hayk Babayan, lecturers, HERITAG program stakeholders, students and other guests. 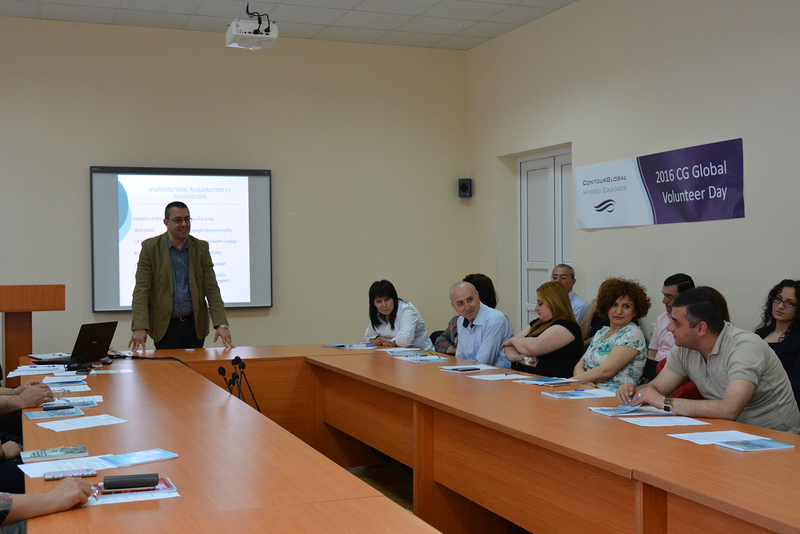 In his welcome speech GSU Rector A. Ghukasyan expressed his willingness to support program implementation. Greatly impressed by his first visit to GSU, Luis Angel Ruiz Fernandez briefly presented HERITAG educational program, the purpose of their visit and answered questions of the attendees. 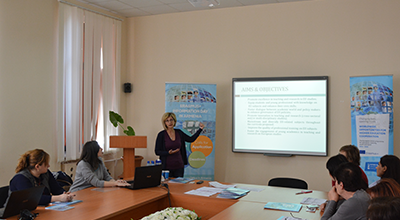 After the presentation was organized project management meeting, during the meeting was presented the main objectives and activities of the program, general management issues also financial and technical issues were discussed. 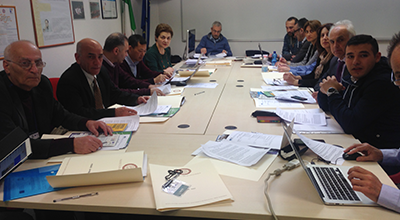 The trainings in the framework of Erasmus+HERITAG planned by UNIBO were held in Rimini (near Bologna), Italy, on 20-31 March, 2017. 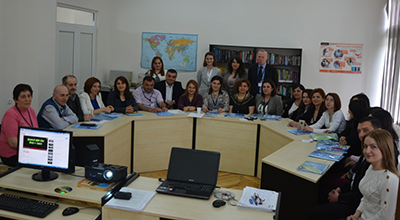 The representatives from the Armenian and Georgian partner institutions were participating in the trainings. 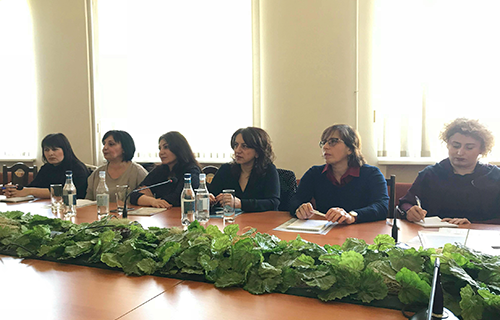 H. Babayan, specialist at the Department of Quality Assurance and international Cooperation and local coordinator of Heritag project, R. Taptughyan, chief accountant at GSU and G. Minasyan, head of the Chair of Economics of GSU participated in the trainings. 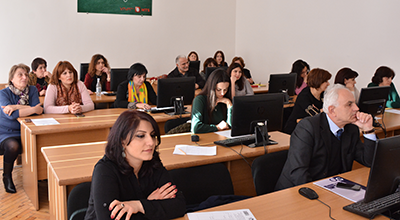 The course of the trainings covered the following topics; Creative industries and tourism Economics of Tourism Cultural Economics Big data in Tourism Culture and tourism for local sustainable development Human resource management and Organization of Tourism Enterprises Web reputation and performance measurement systems in the tourism industry. 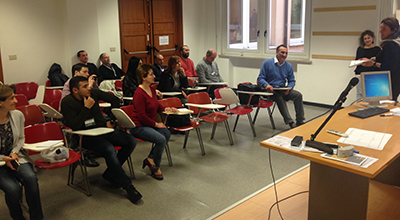 During the training weeks the participants visited Innovation Square and Start-Up Centre in Rimini. 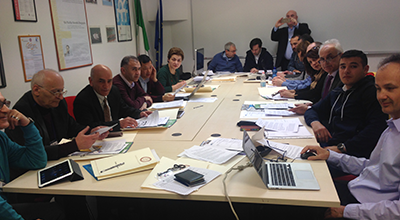 A project partner meeting in the framework of Erasmus+HERITAG project was held in Rimini, Italy, on 23-24 March, 2017. 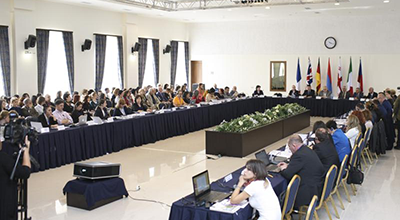 The representatives of the partner member institutions from Armenia, Georgia, Spain, Greece and Italy were present at the meeting. 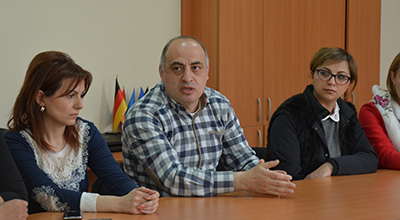 A. Ghukasyan, rector of GSU, N. Safaryan, person in charge of International cooperation and projects and H. Babayan, specialist at the Department of Quality Assurance and international Cooperation and local coordinator of HERITAG project from GSU were participating in the meeting. The curricula designed by the respective universities, the advisory board and its membership, the results of the survey carried out among the stakeholders and students, the upcoming activity plans as well as some financial and technical issues were represented and discussed during the two-day session of the meeting. 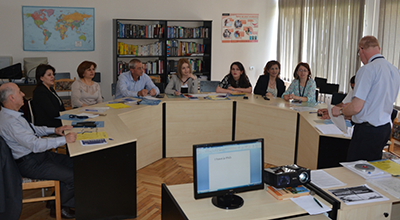 A three-day workshopon “New Teaching Methods” (WP 6.2) within the frames of EU funded Erasmus+HERITAG project “Higher Education Interdisciplinary Reform in Tourism management and Applied Geoinformation Curricula” was held on 14-16 of May, 2018, at GorisState University. 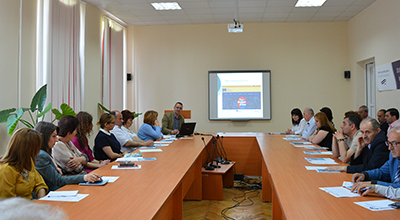 The materials presented at training workshop by the experts were concerned with the introduction of some new teaching and learning methodsat university level. 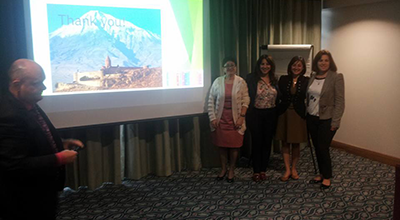 Case studies, problem and project based learning(PBTs) and Interactive teaching methods were presented as effective teaching methods in the professional spheres of Tourism Management and GIS. 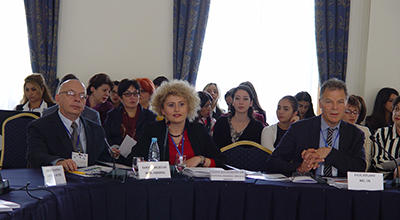 The experts and specialists of the partner institutions referred to the best practices of the introduction and application of the above-mentioned methods. During the discussions they also spoke about the outcomes, plans and problems relating to the application of these methods in their respective universities. 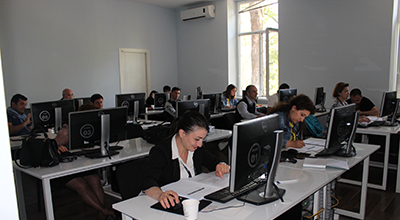 The workshop was designed for the representatives of the academic and administrative staff of GSU and partner institutions. 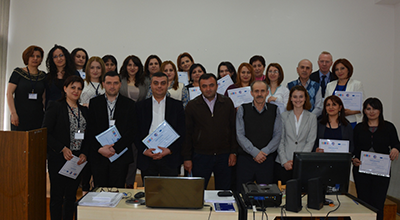 35 trainees participated in the workshop and were awarded certificates. 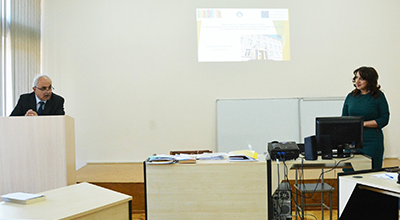 At the opening ceremony of the workshop the rector of GSU A. Ghukasyan and the project coordinator Luis Ruiz delivered welcome speeches. 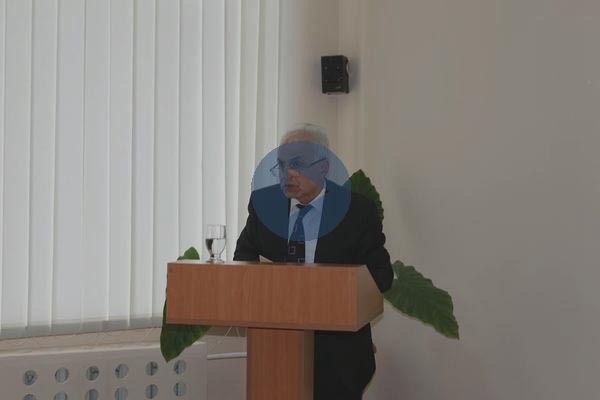 The rector of GSU A. Ghukasyan spoke about the importance of the international cooperation, the achievements and future plans connected with it. He briefly spoke about the phases of the implementation andtangible outcomes of “HERITAG” project. He particularly stressed the introduction of the new Master academic program “Tourism Management” at GSU with the methodological support of the specialists from the partner universities and the acquisition of the necessary equipment to ensure the successful implementation of the MAP, introduction of GIS in Tourism and carrying out research in the field. 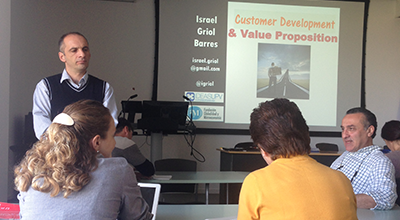 • Oscar Morant Startup Creation and Business Plan Generation (UPV). 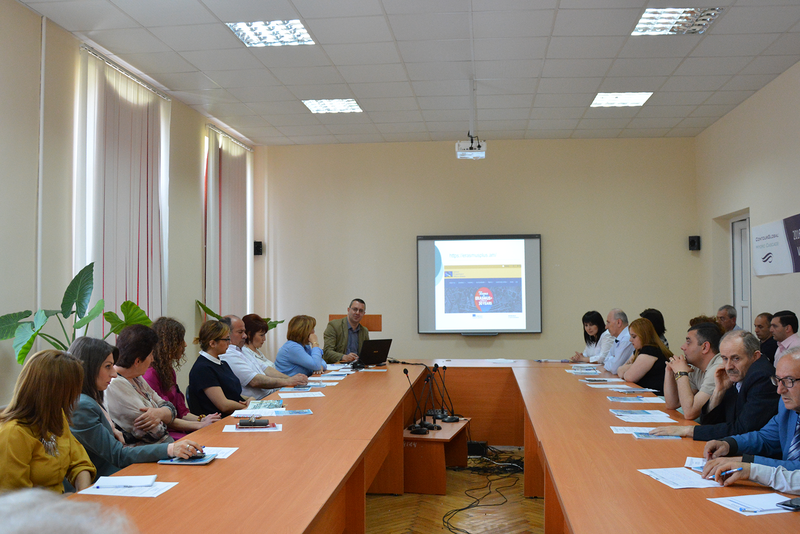 GSU representatives made a presentation on the plans and problems relating to the introduction and implementation of the reforms in the new Master academic program “Tourism Management”. 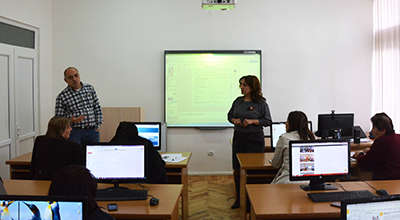 The curriculum of the program includes the courses “Application of GIT in Tourism” and “The technology of data collection and data creation”. 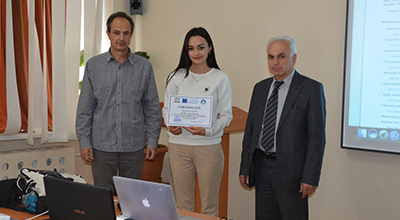 The partners of the project, who have great experience and professional skills in the field, expressed willingness to support GSU with necessary consultation and teaching materials in order to contribute to the successful implementation of the academic program. 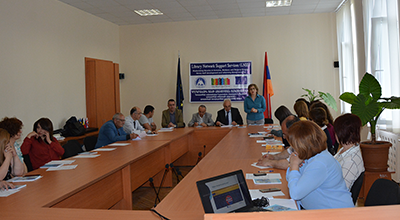 At the end of the first day of the training workshop the launch of the new GIS Laboratory at GSU was another significant event with the participants of the workshop, the representatives from GSU academic and administrative staff, the local municipality, NGOs and Mass Media. The GIS lab was established in the frames of Erasmus+HERITAG and is equipped with the necessary equipment for trainings of students and professionals in GIT applied to cultural heritage and tourism as well as the preservation, documentation and mapping of the architectural and historical monuments, cultural heritage and fostering tourism business and entrepreneurship. At the opening ceremony the rector of GSU delivered a speech emphasizing the importance of the importance of GSU partnership in HERITAG project and the GIS and GIT applied to spheres of management and economics considering the fact that their application will foster the research and study of the problems available in tourism and economy as well as enable the students and specialists of the sphere to gain new skills and capacities. 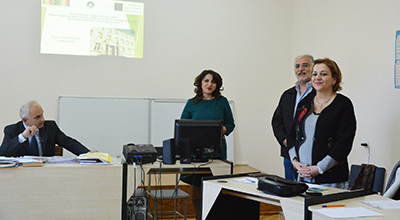 The Final Conference of Erasmus+’Higher Education interdisciplinary Reform in Tourism management and Applied Geoinformation’ (HERITAG) project was held on 3-6 April 2019, at the project partner Georgian Technical University in Tbilisi, Georgia,. 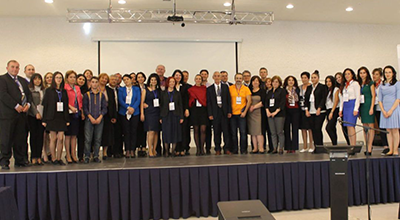 The representatives from all the partner universities and beneficiary organizations of HERITAG, as well as representatives from Georgian and Armenian tourism federations participated in the conference. 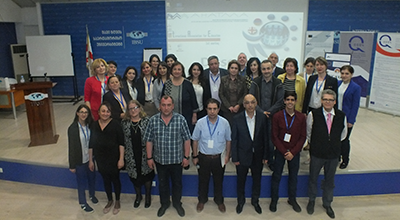 Gurgen Minasyan, Associate Professor at the Chair of Economics and Management, person in charge of the Laboratory of Geographic Information System (GIS) as well as member of ERASMUS+ HERITAG project working group participated in the conference and represented Goris State University,. 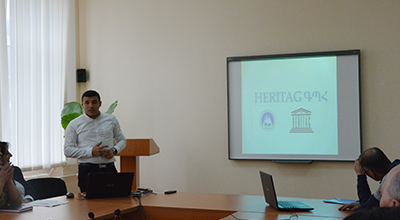 According to the agenda, HERITAG final conference was held on April 3, during which G. Minasyan made a speech on behalf of Goris State University, speaking about the impact and important outcomes of the project at GSU, the necessity of introducing the Master Academic Program “Tourism Management”, and the creation of the curriculum, modules and the interdisciplinary reforms. 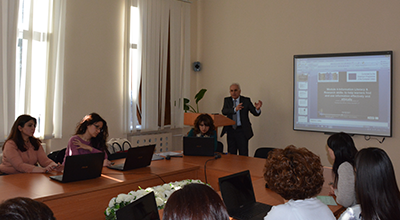 G. Minasyan also touched upon the GIS laboratory at GSU, GIS training courses and Labour Market/Career Day and other events implemented in the frames of the project. 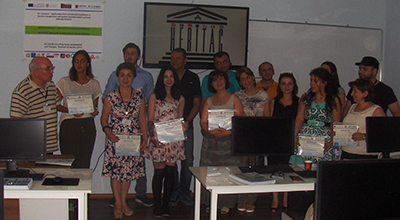 The HERITAG-CulturWB Inter-coaching Workshop was held on April 4, and the final HERITAG Project Management meeting to discuss and review the deliverables and partner inputs for the final report, took place on April 5. 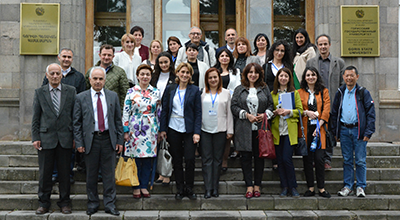 On the last day of the conference, April 6 a site visit was organized for the participants to Kakheti Region of Georgia.